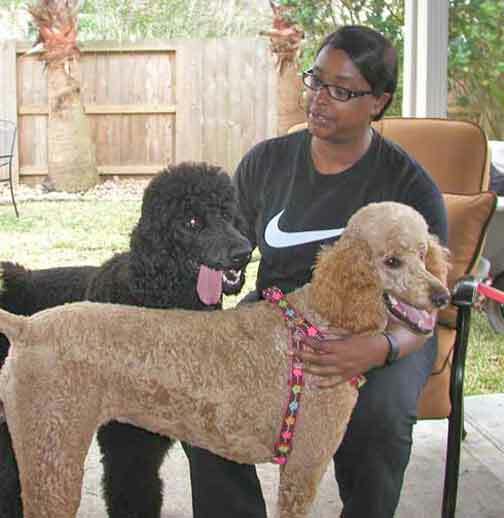 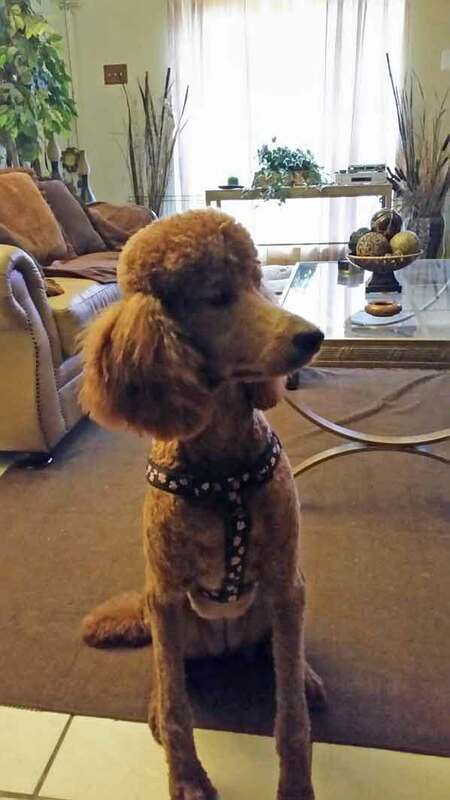 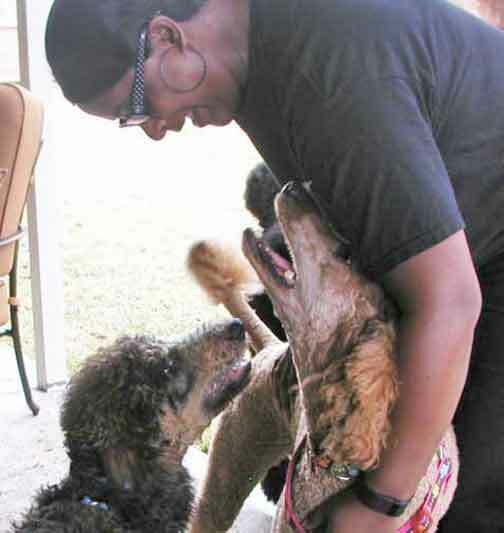 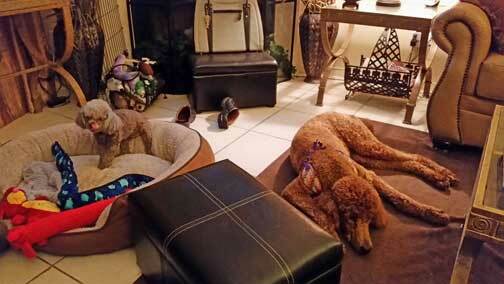 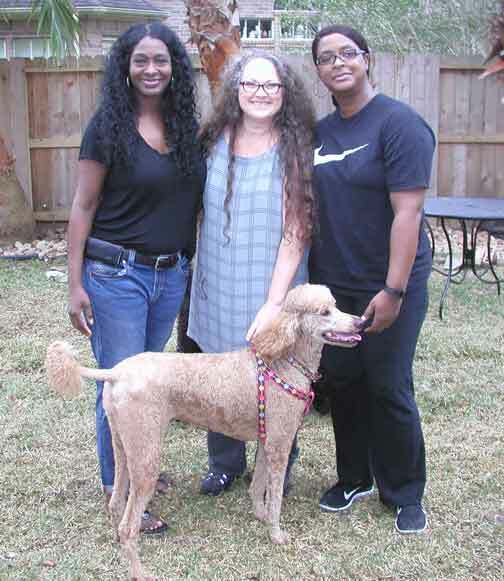 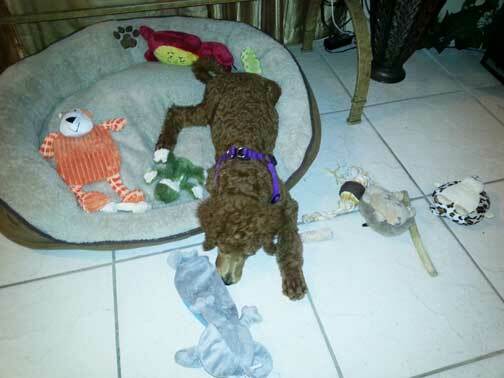 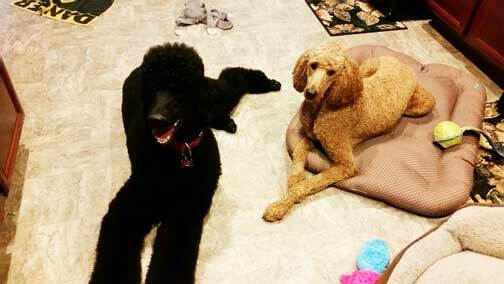 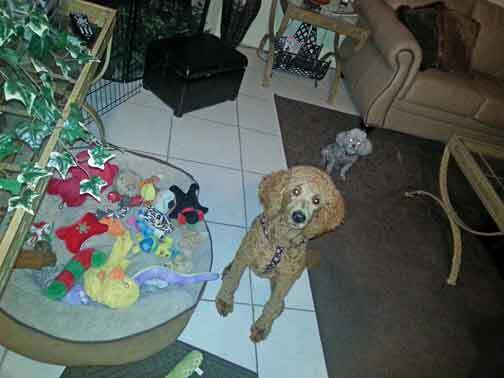 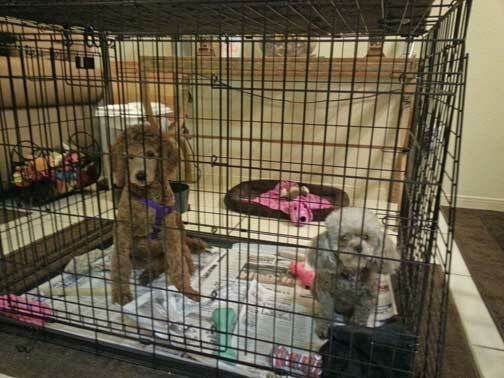 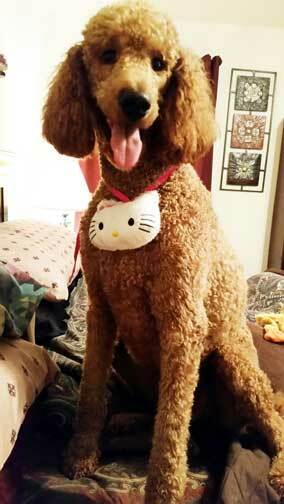 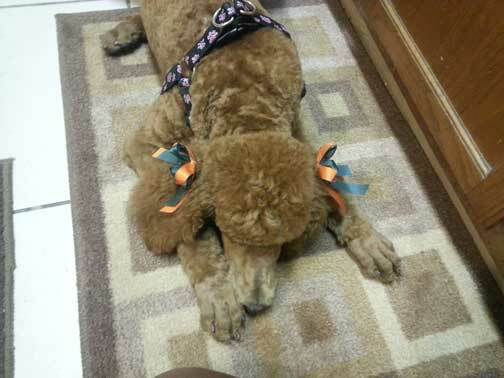 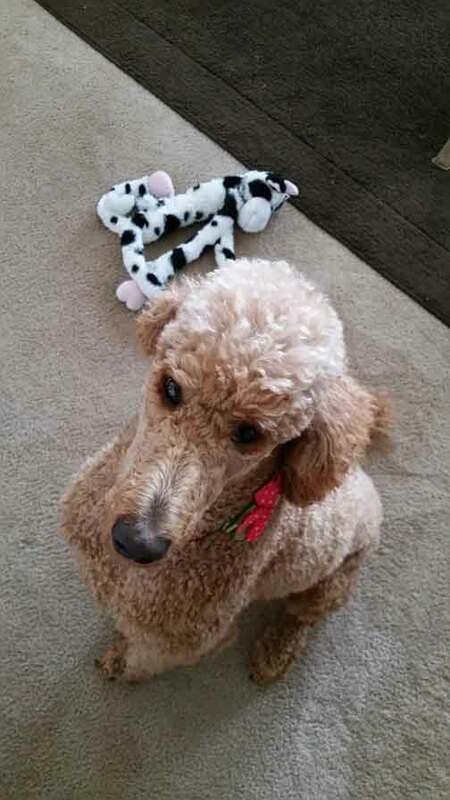 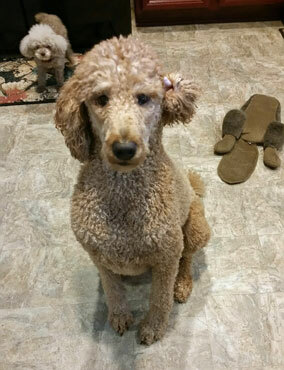 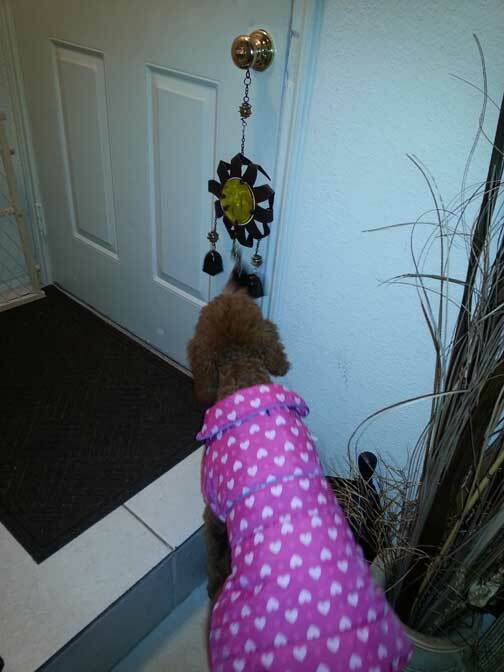 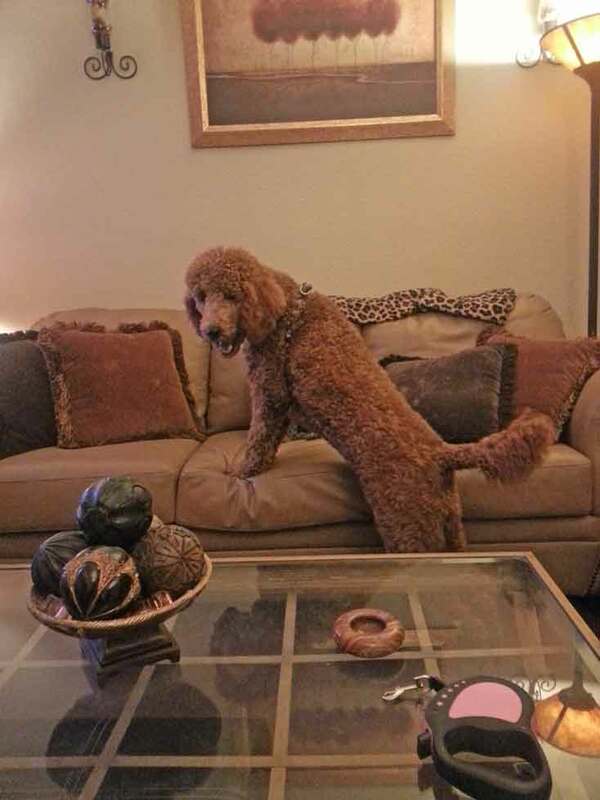 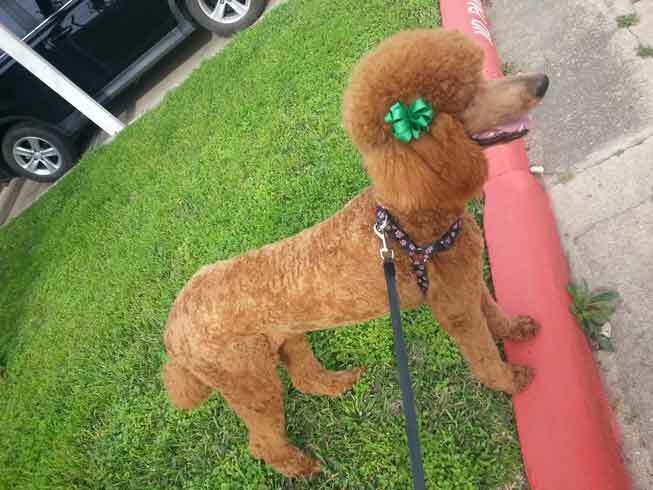 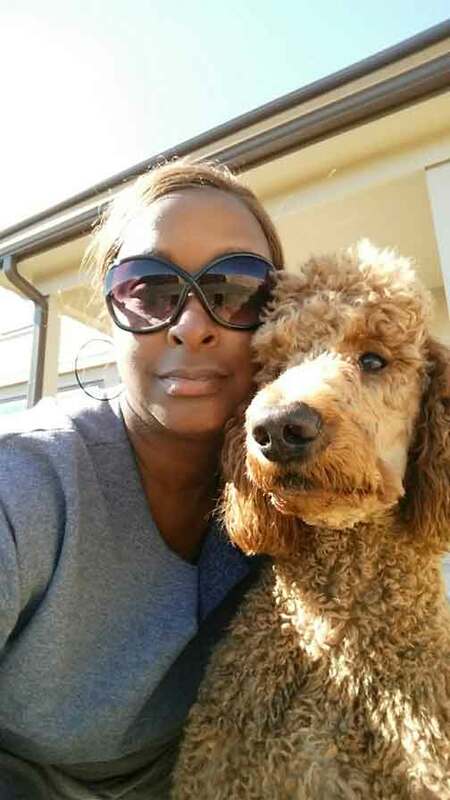 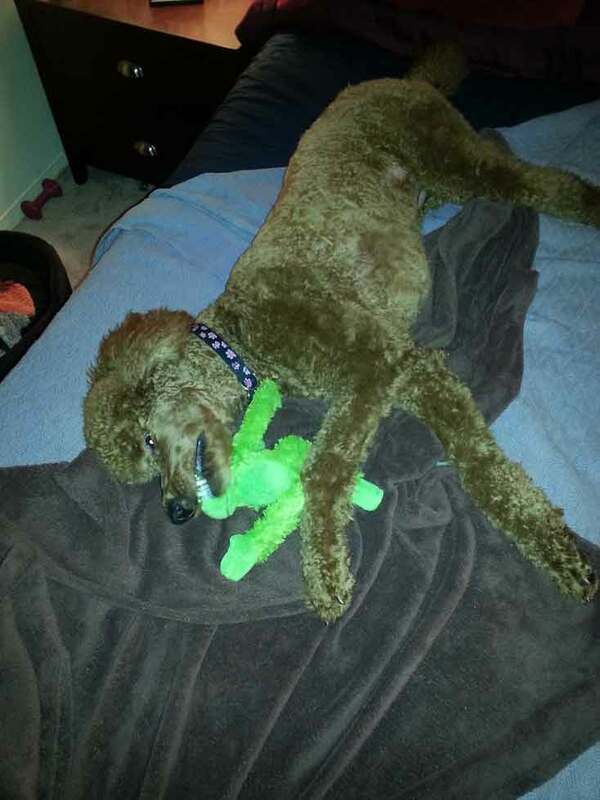 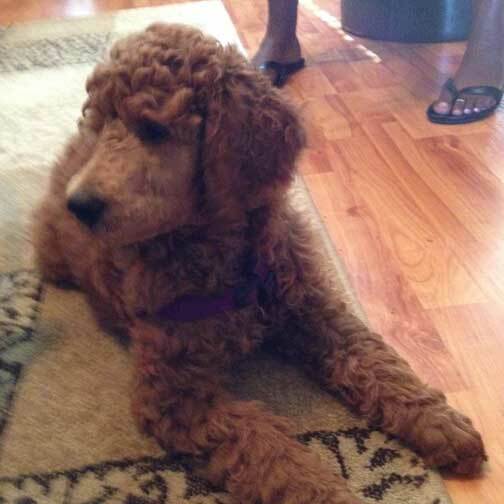 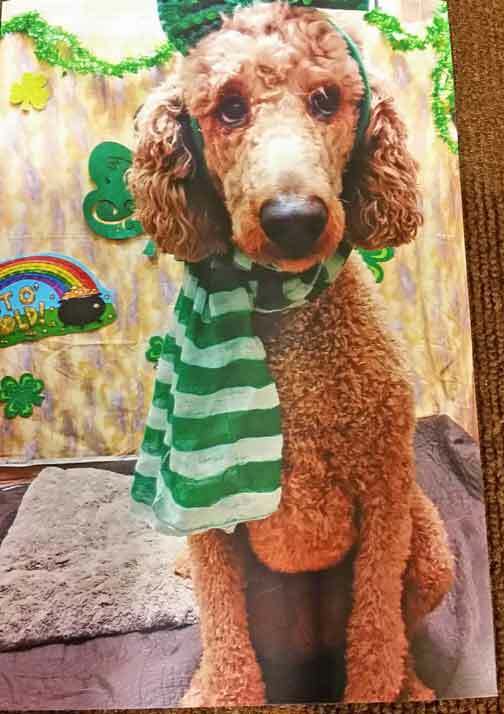 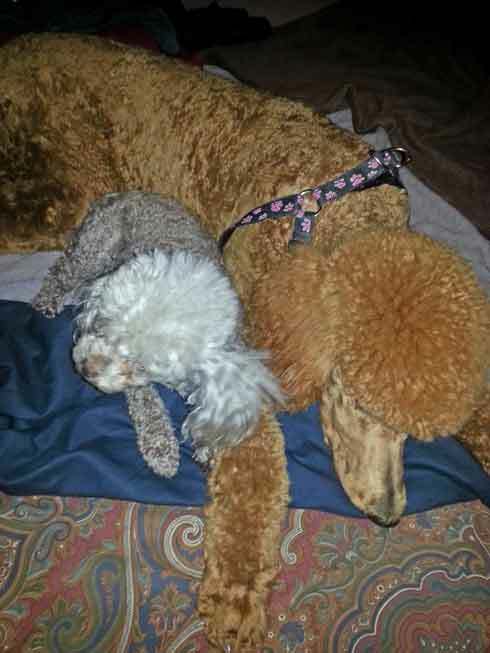 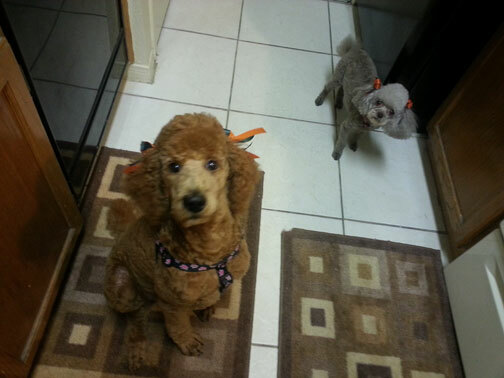 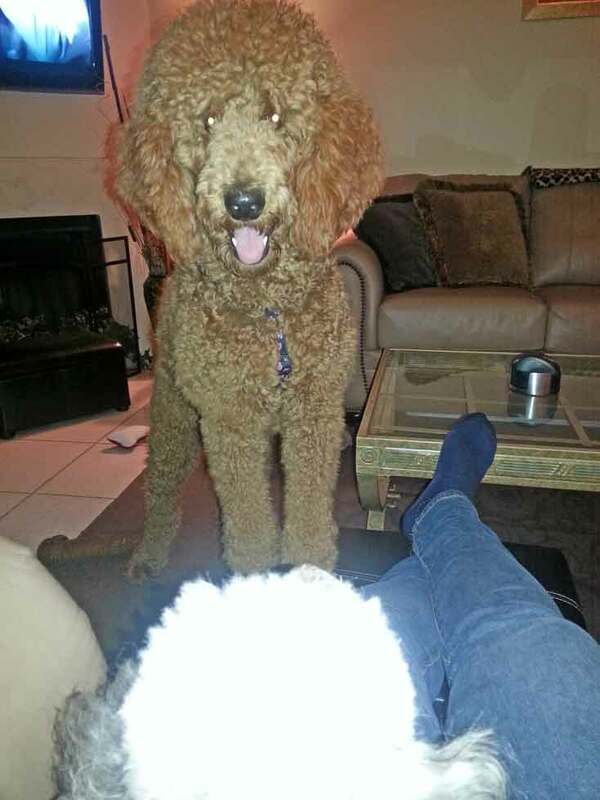 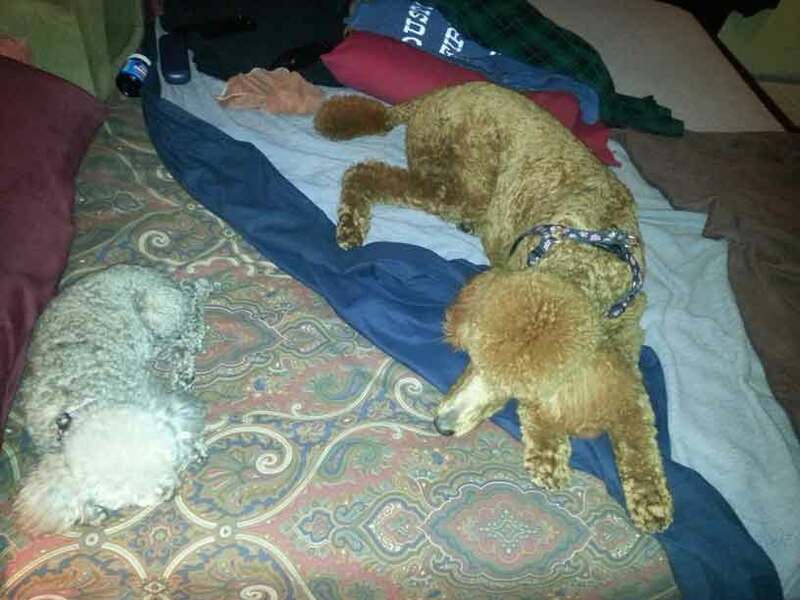 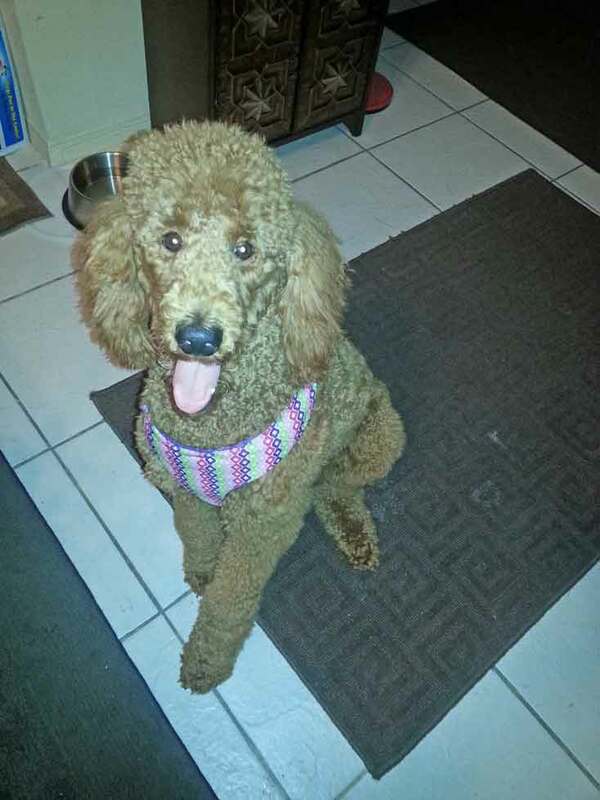 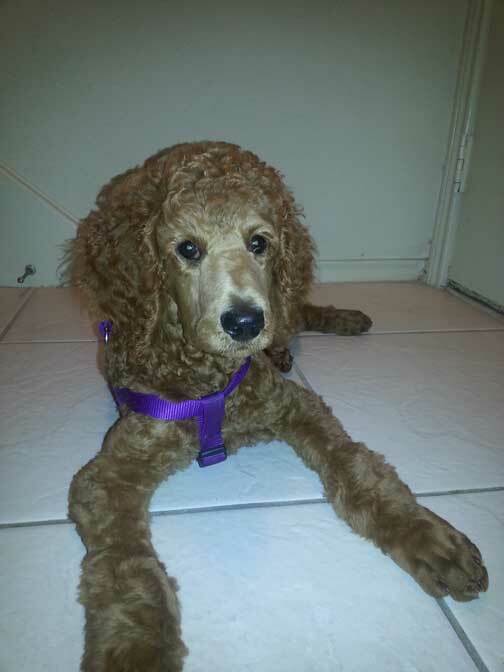 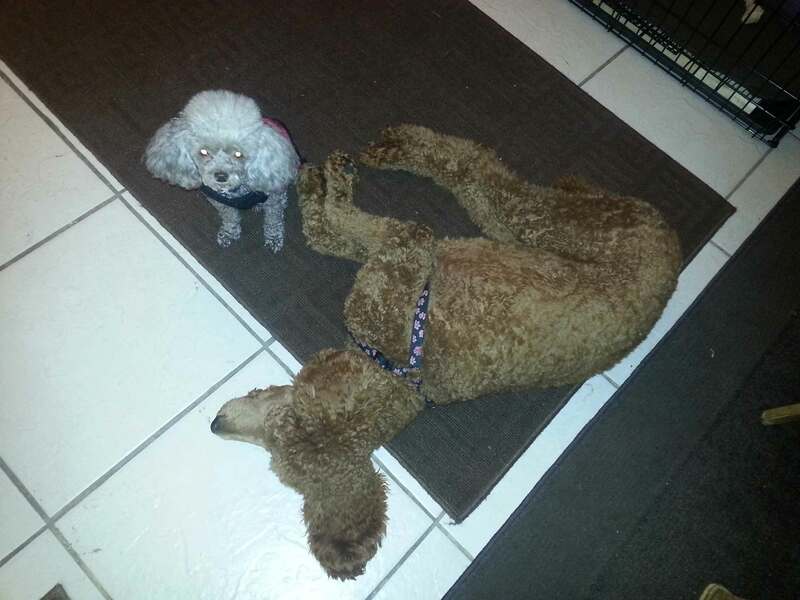 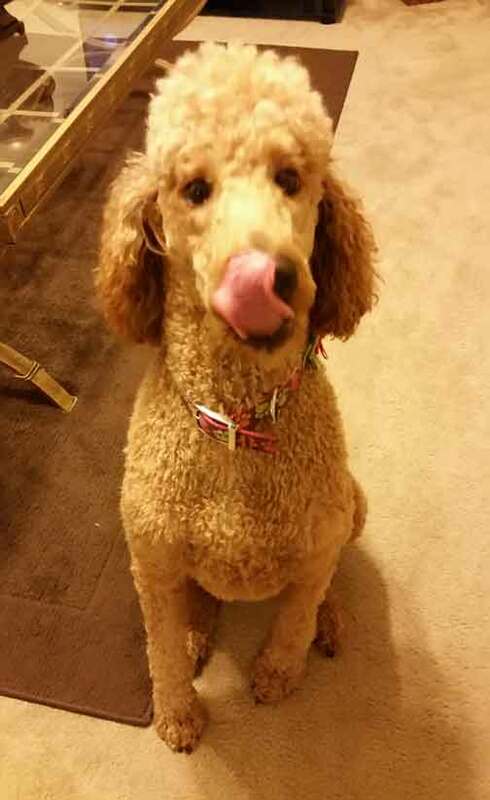 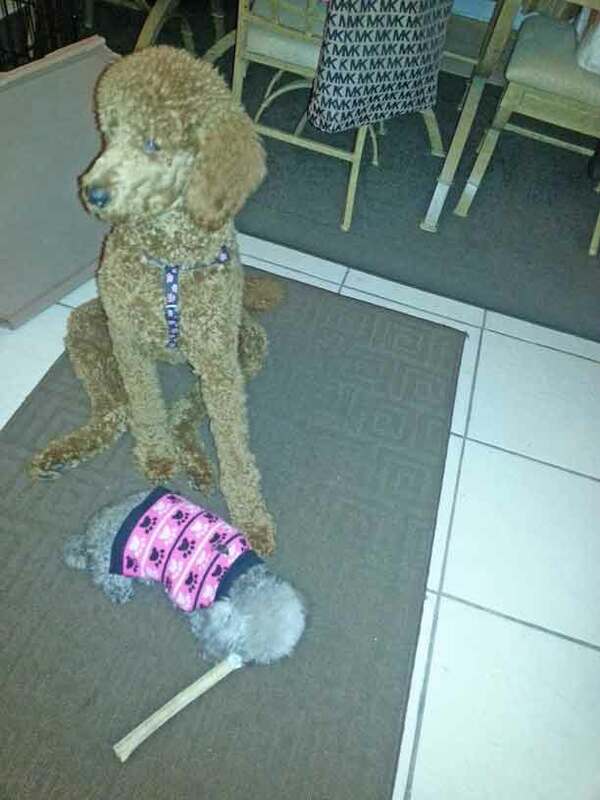 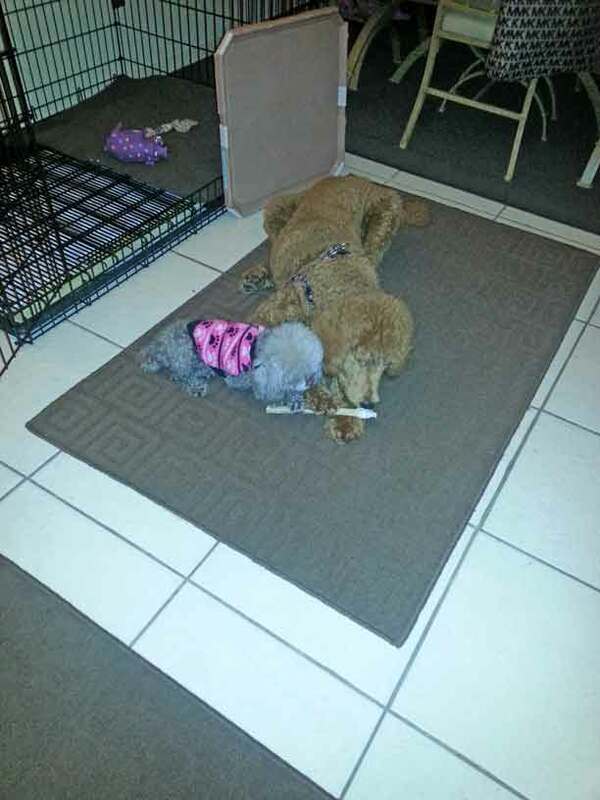 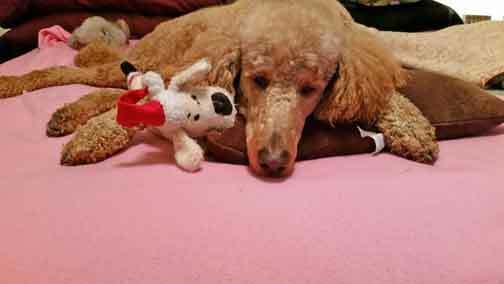 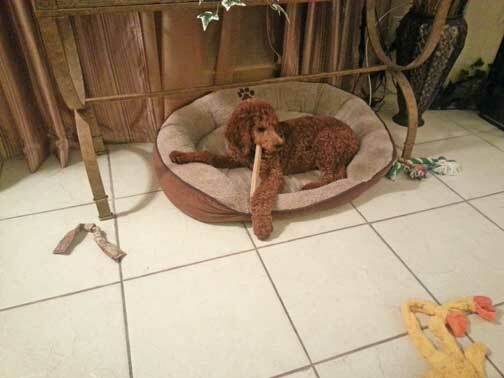 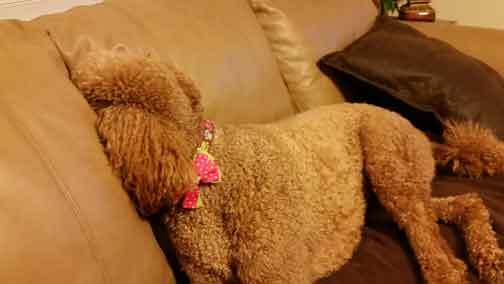 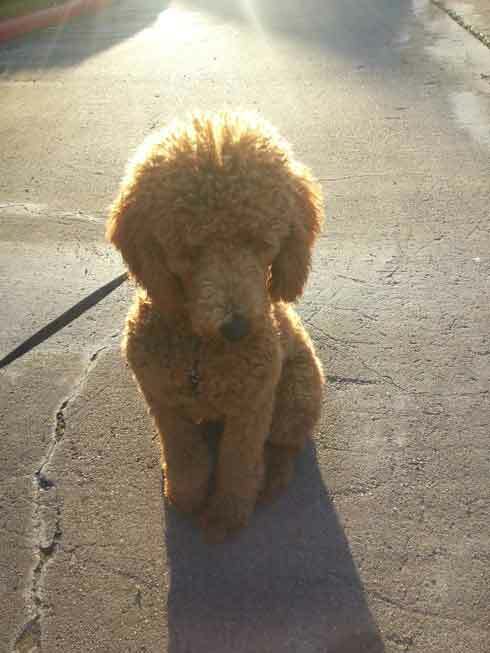 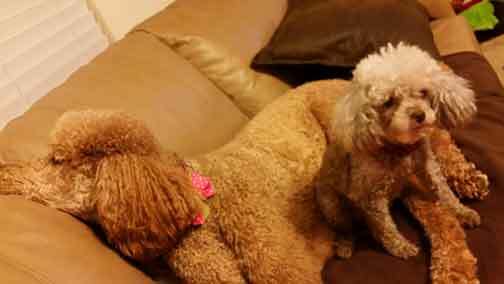 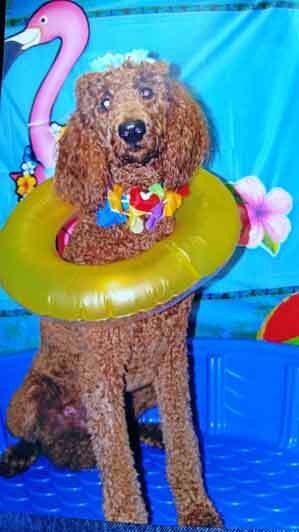 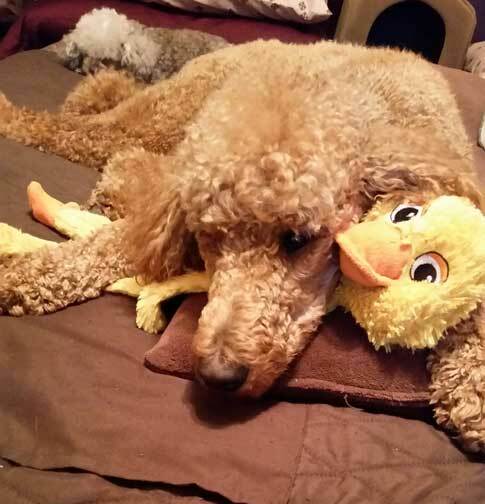 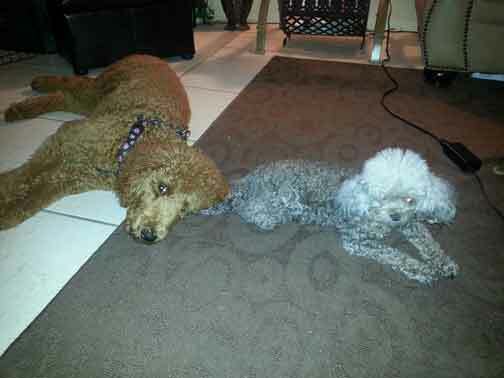 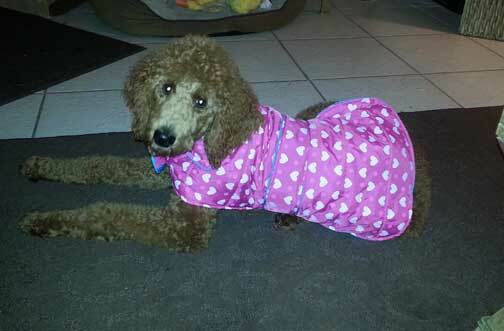 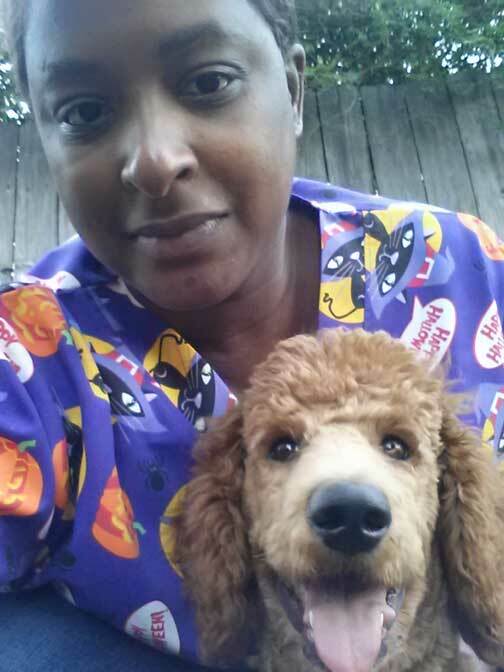 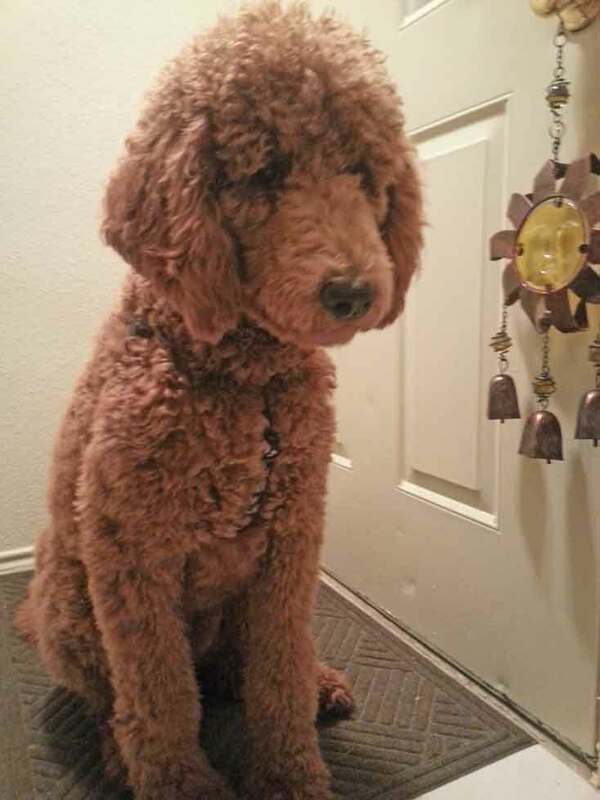 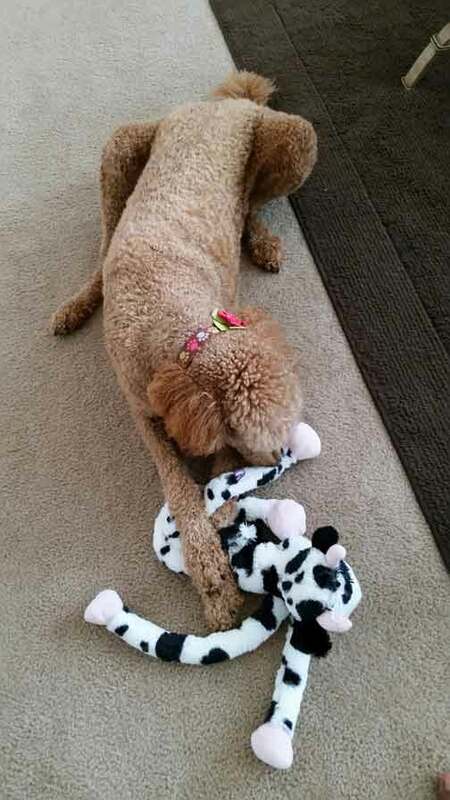 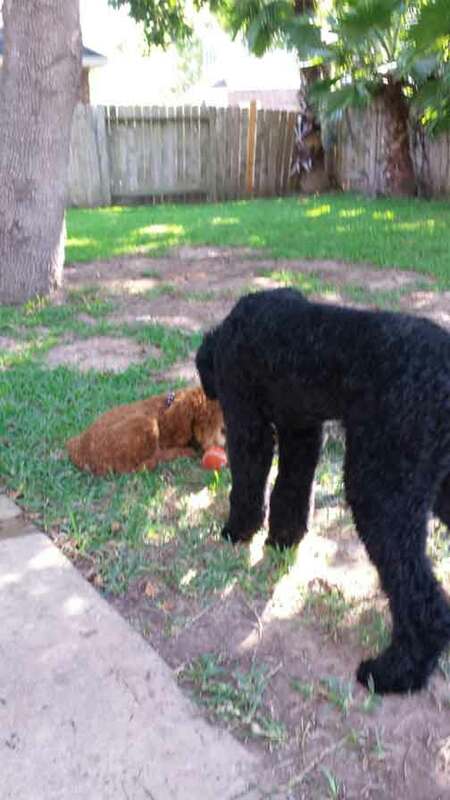 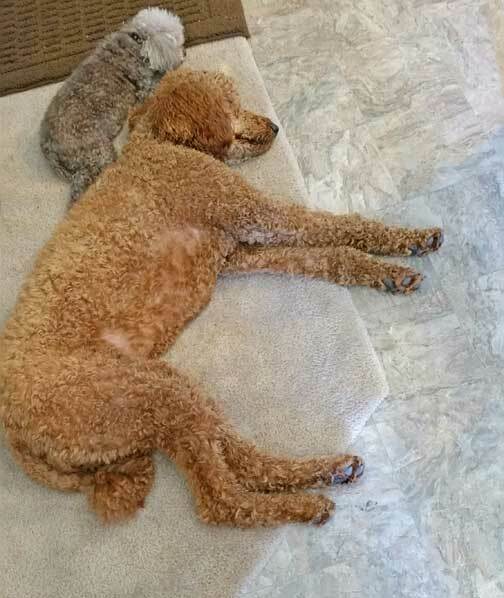 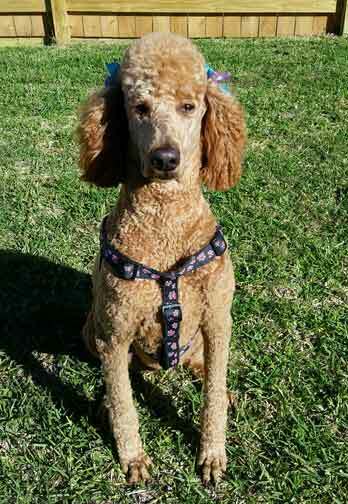 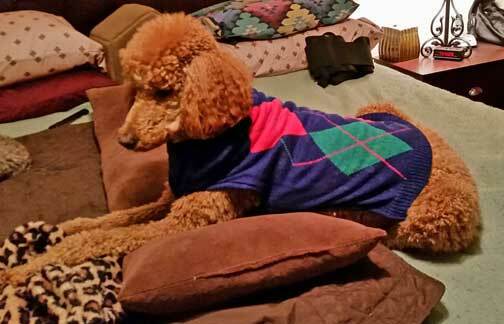 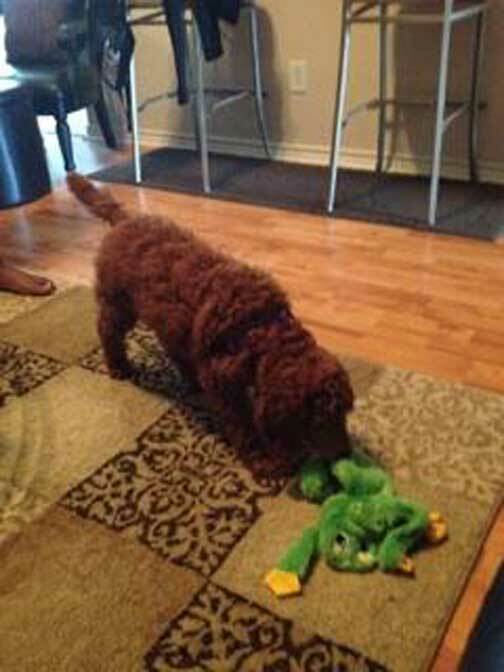 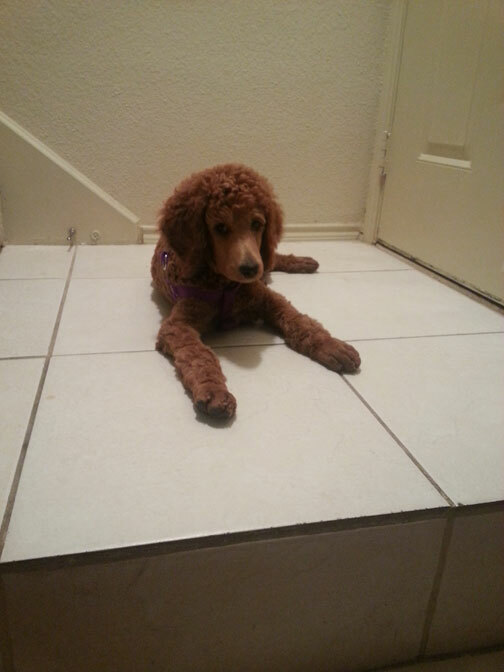 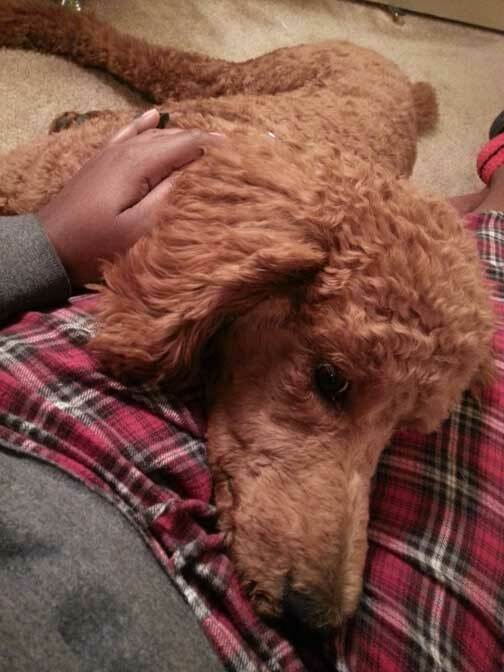 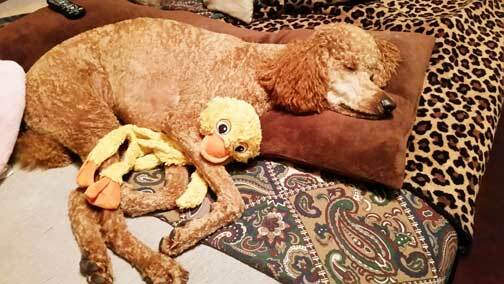 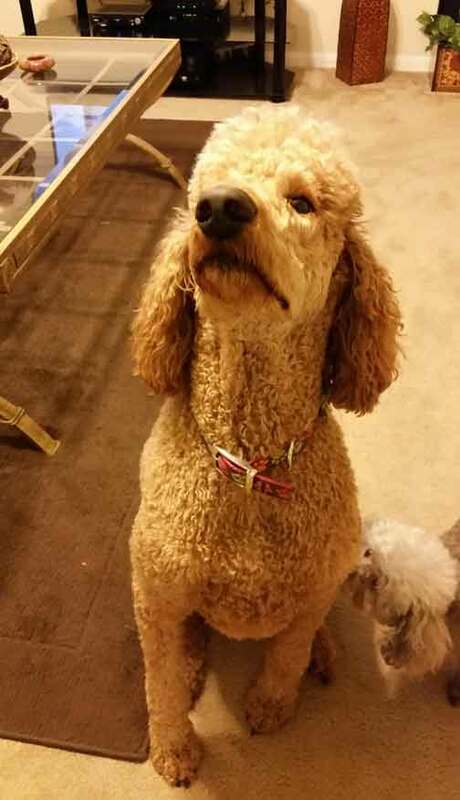 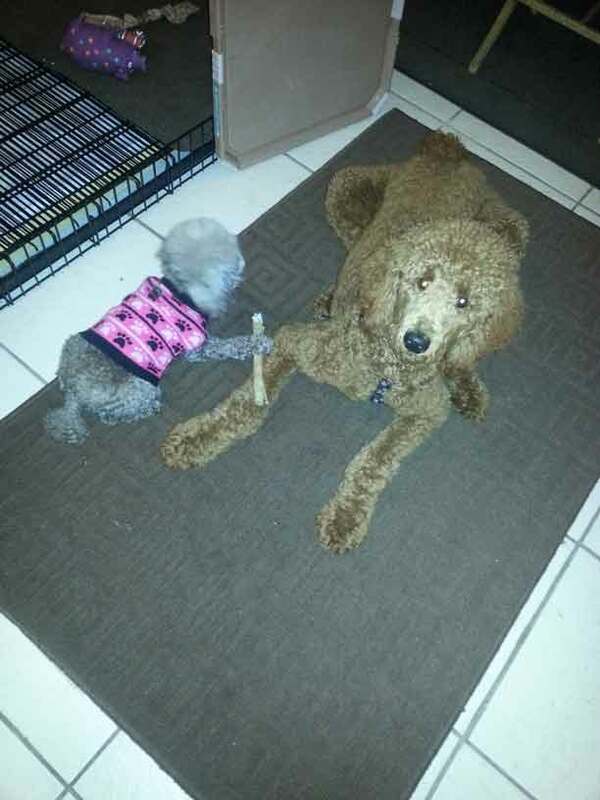 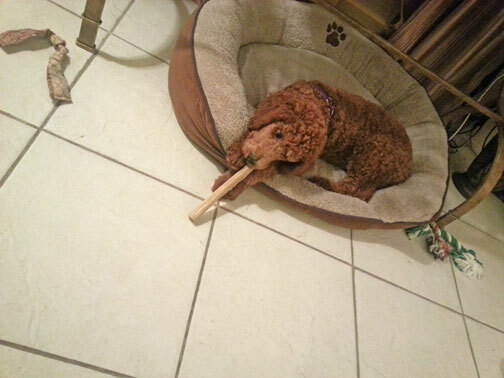 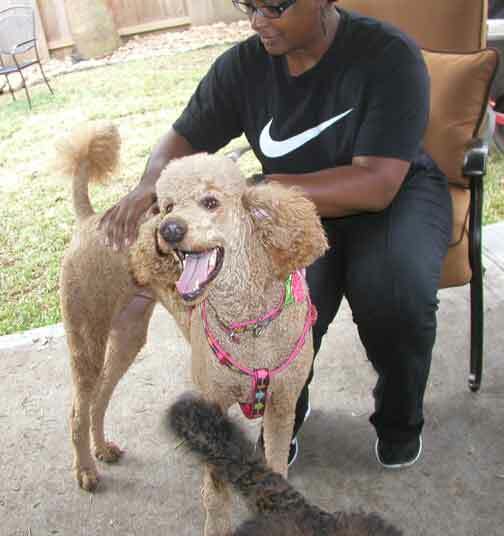 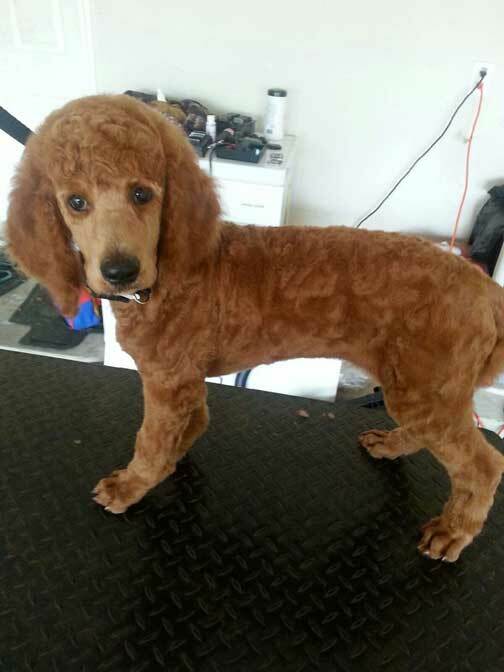 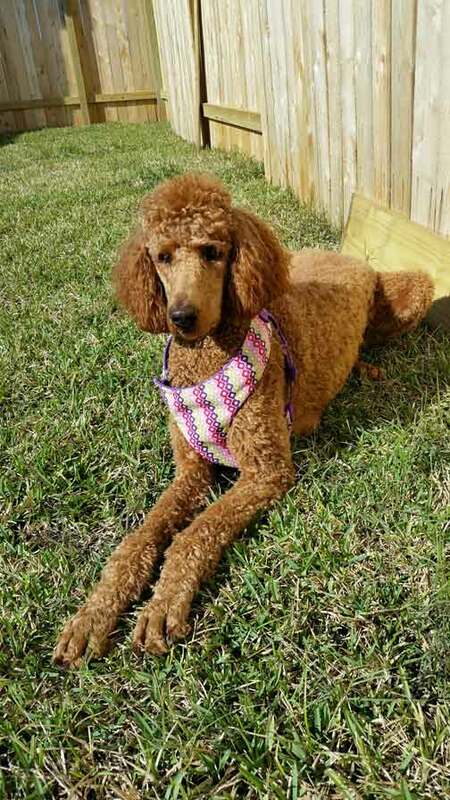 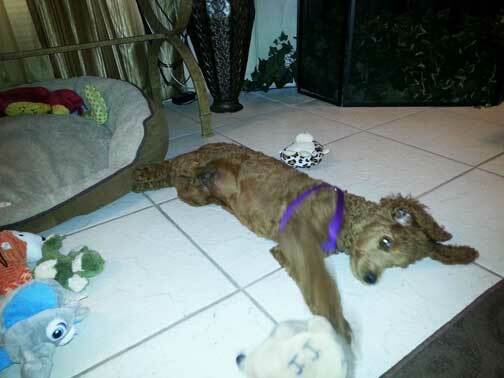 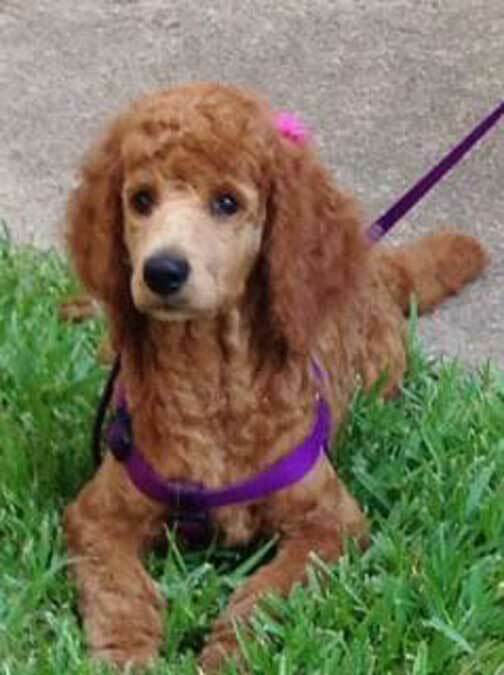 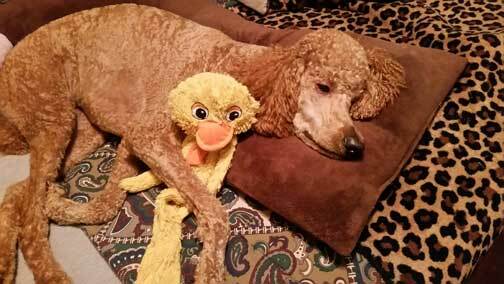 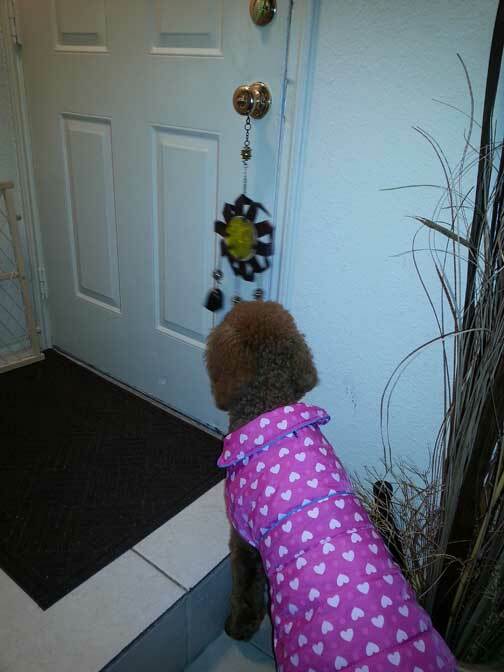 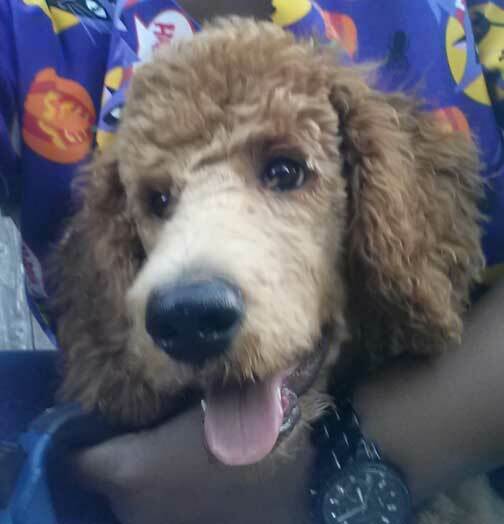 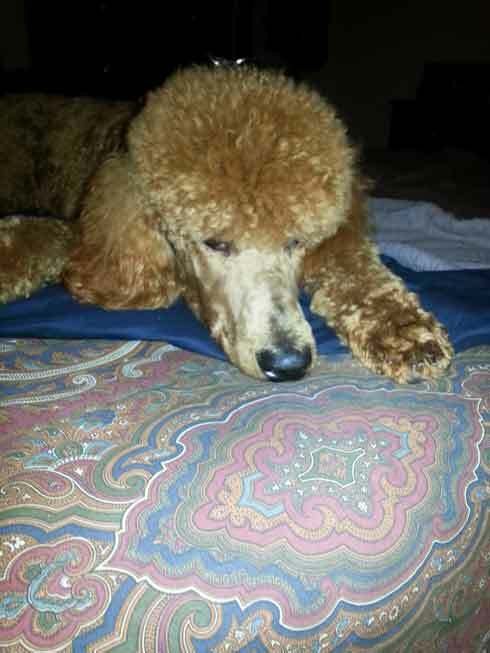 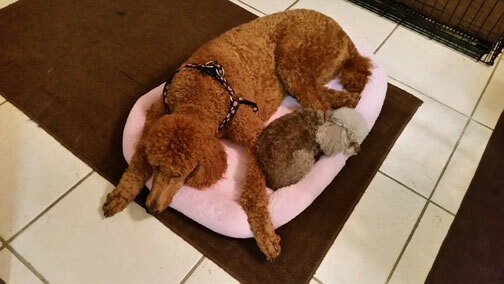 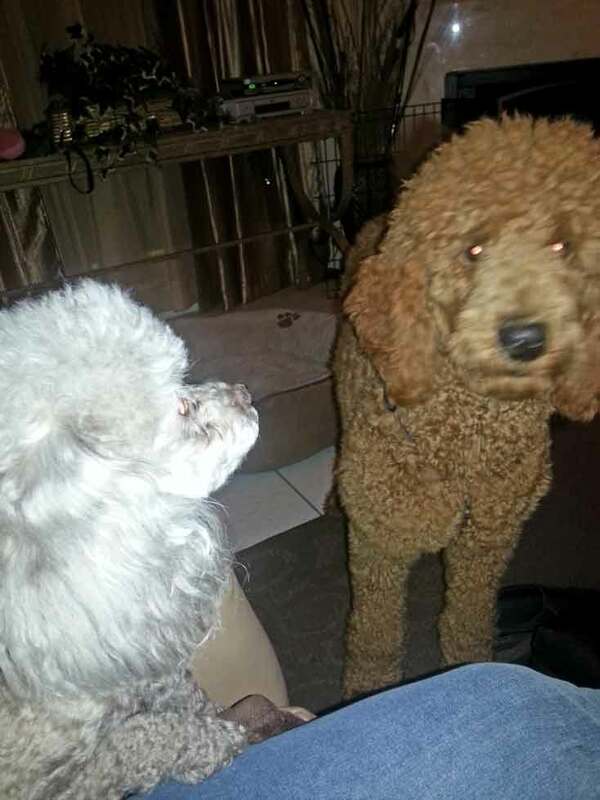 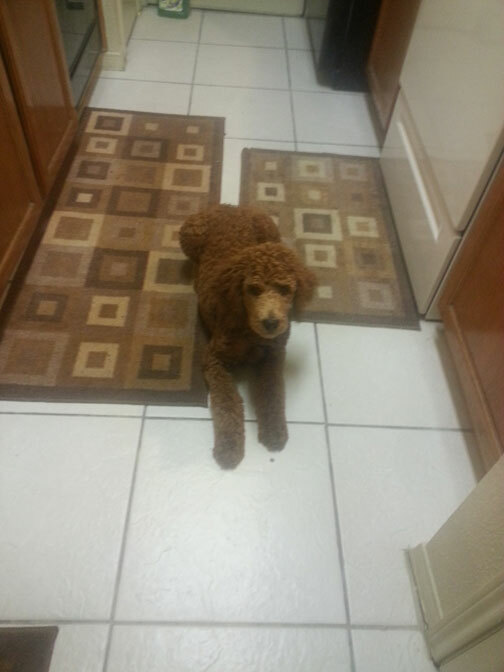 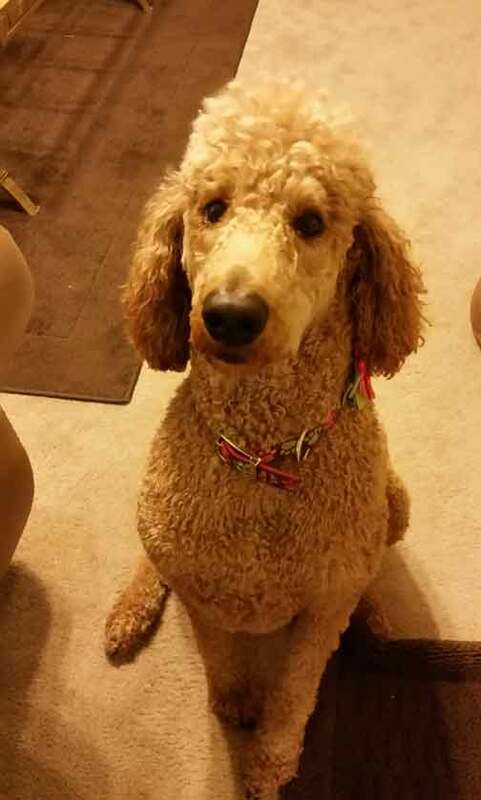 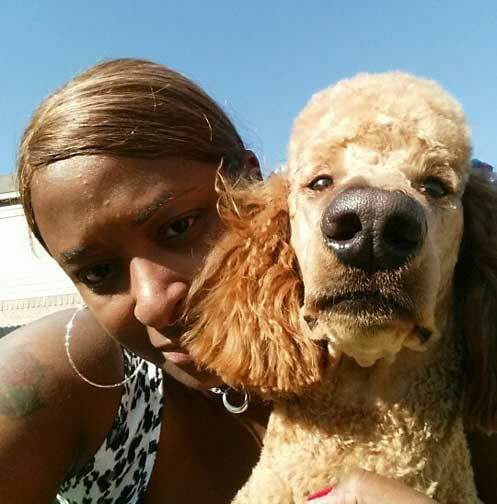 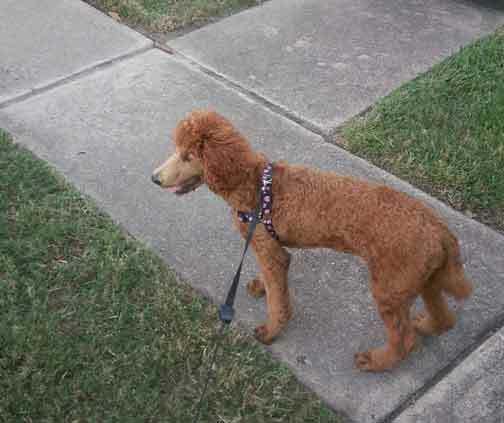 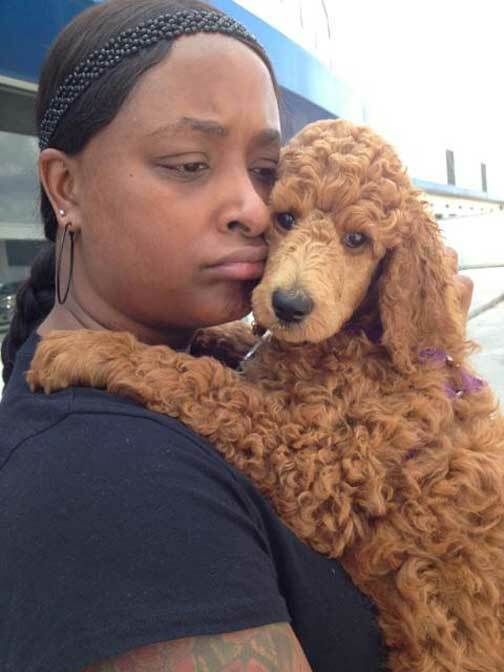 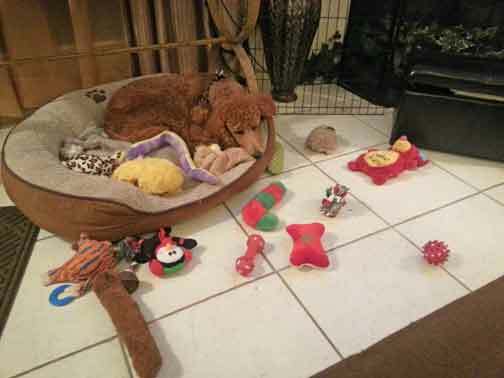 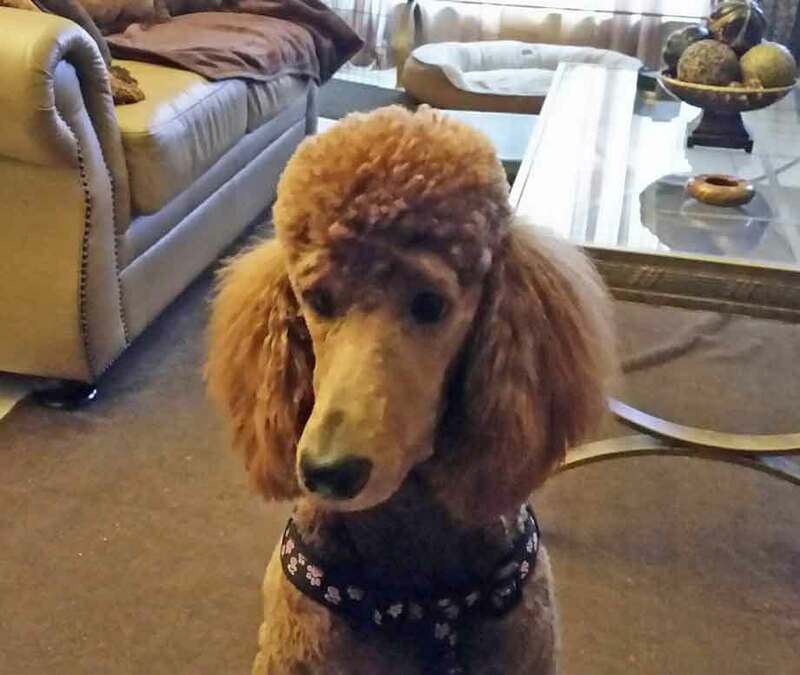 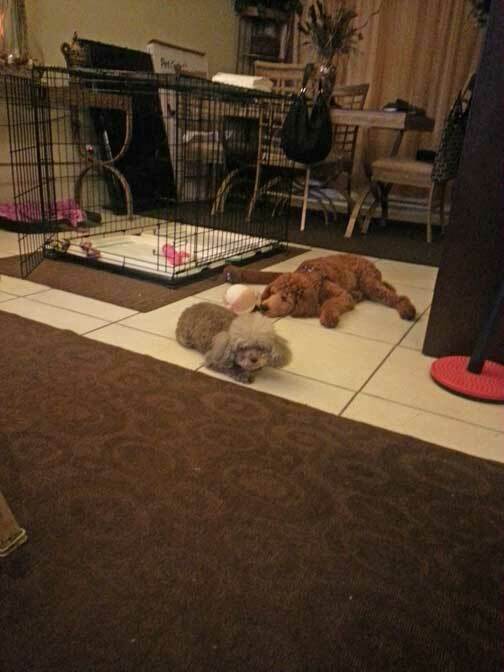 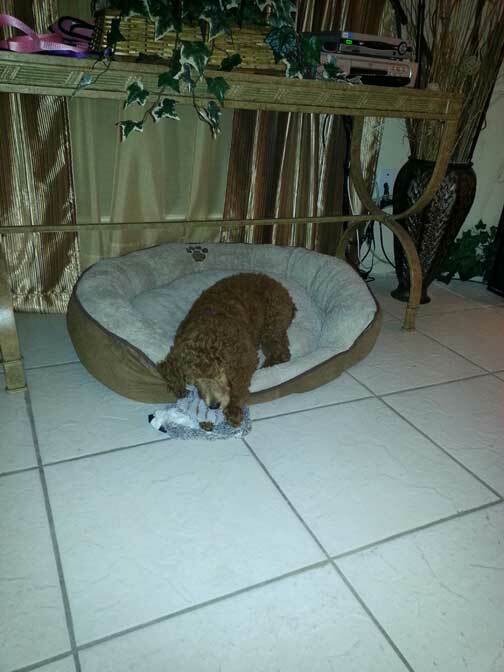 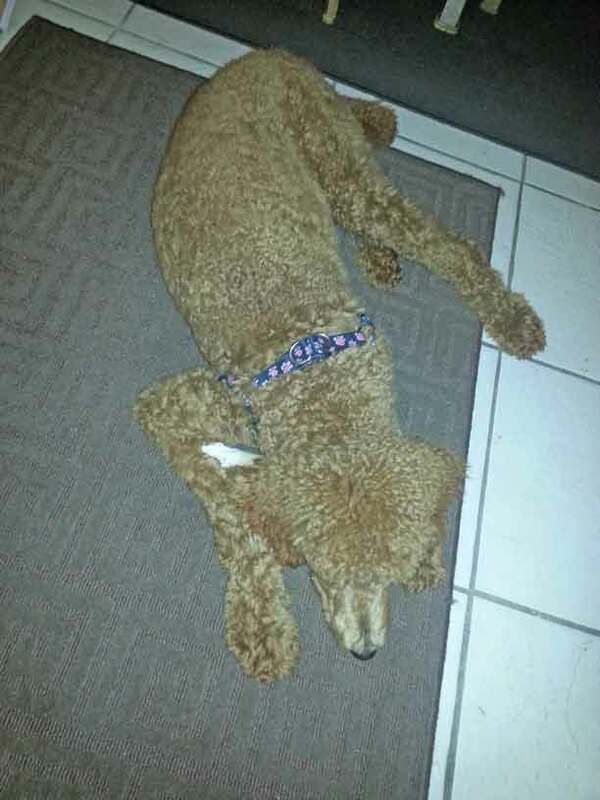 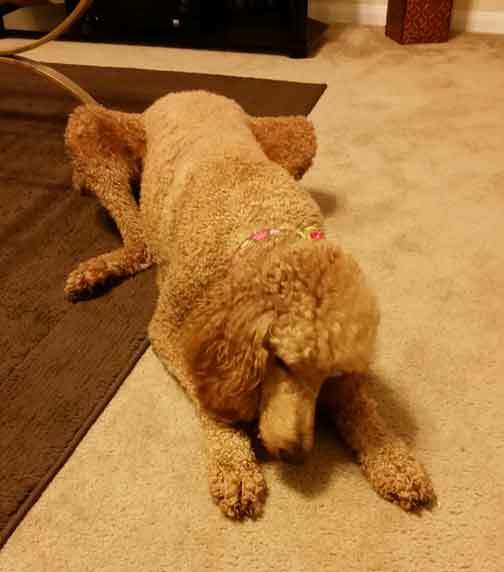 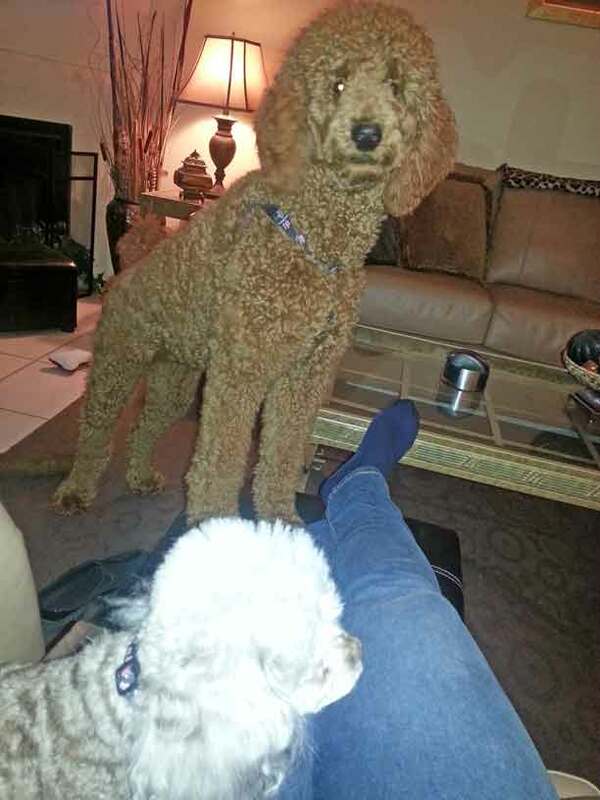 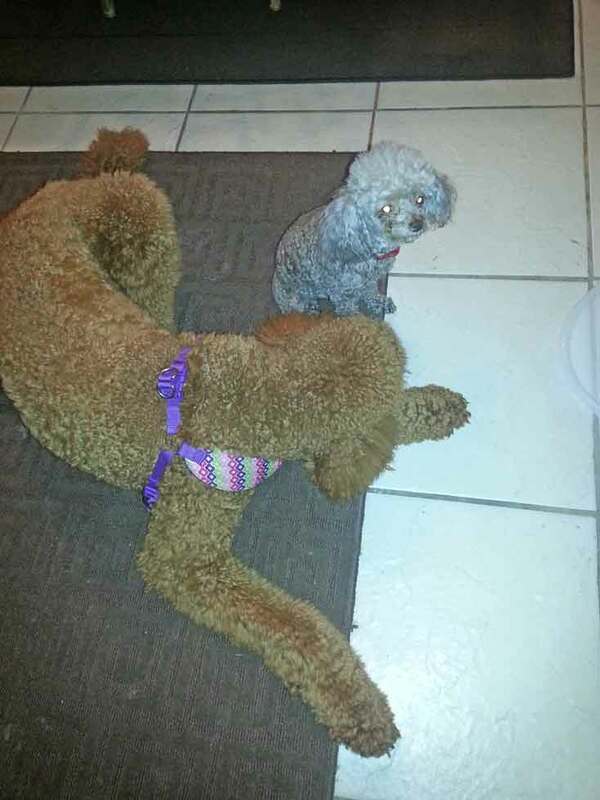 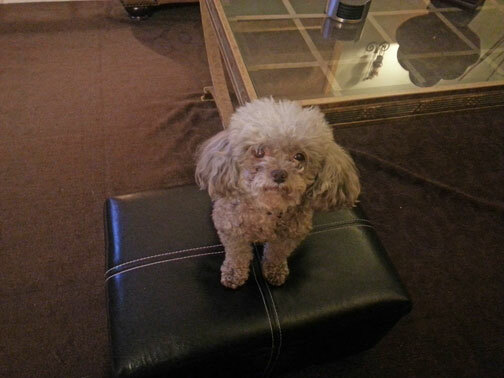 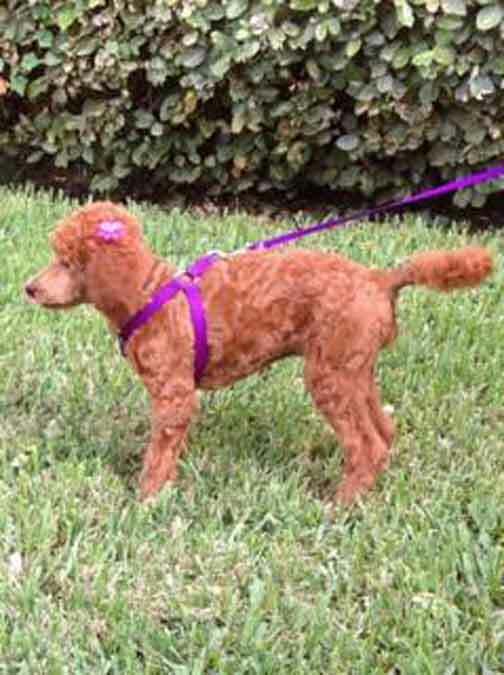 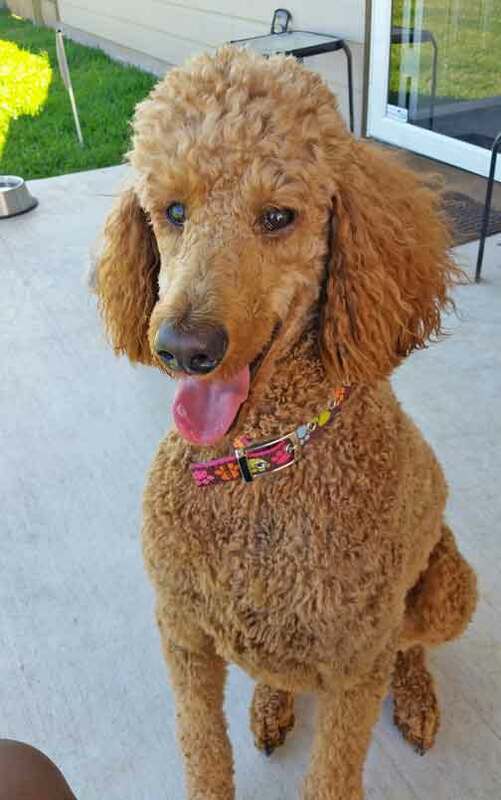 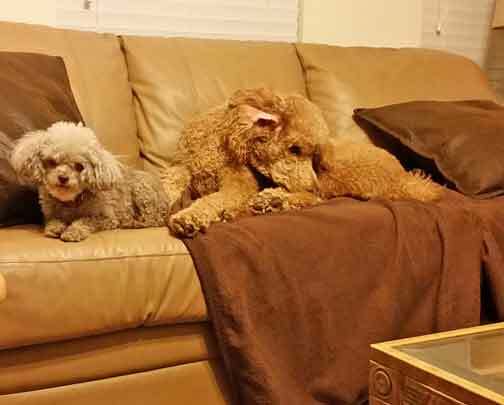 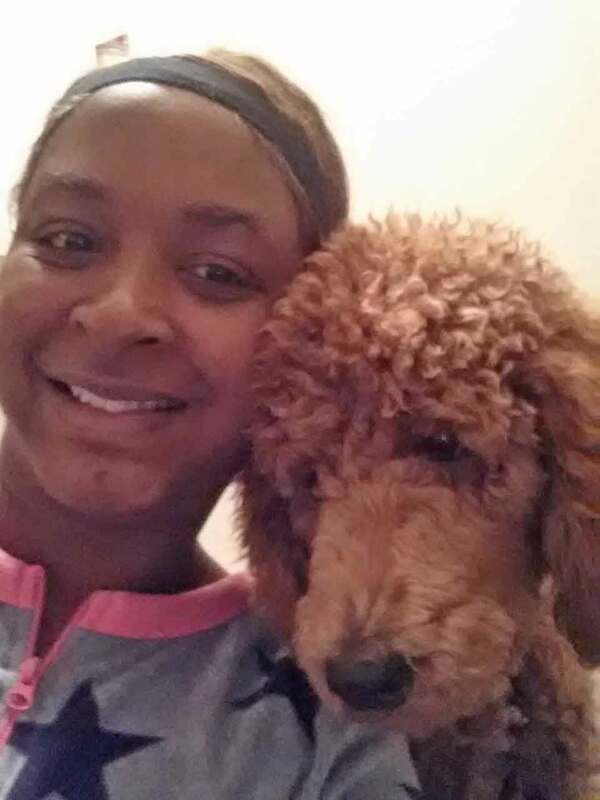 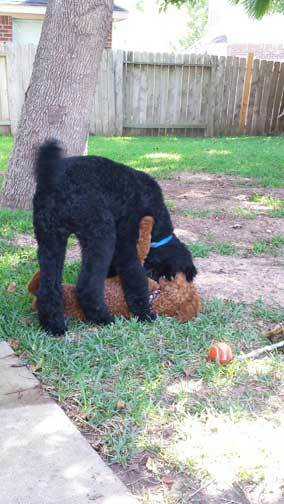 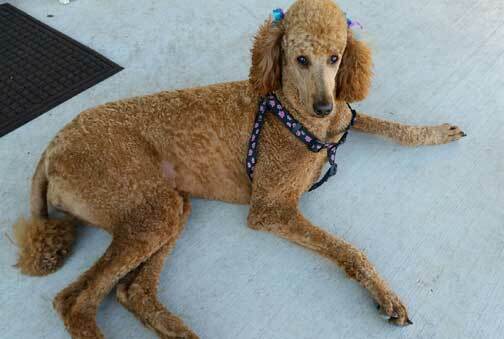 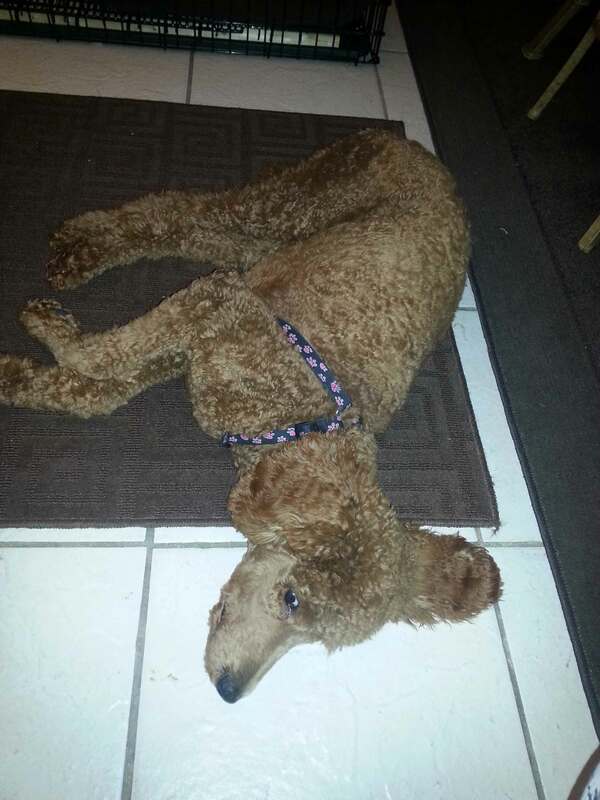 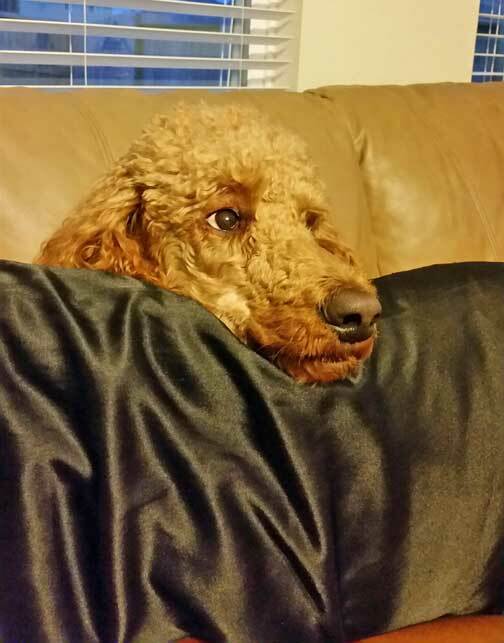 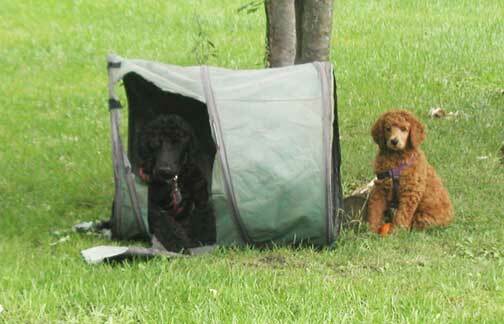 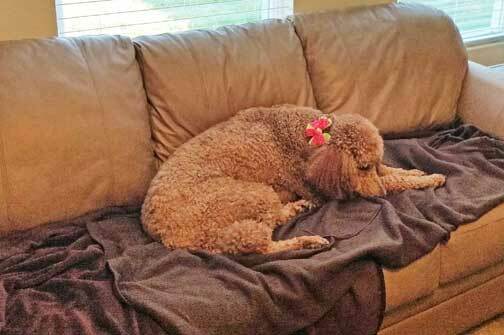 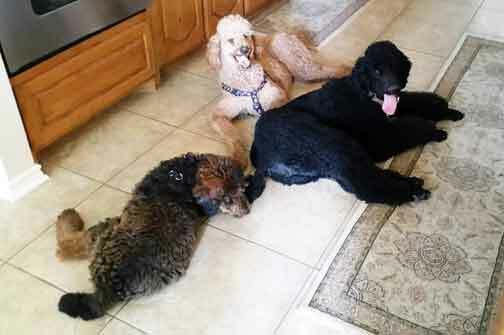 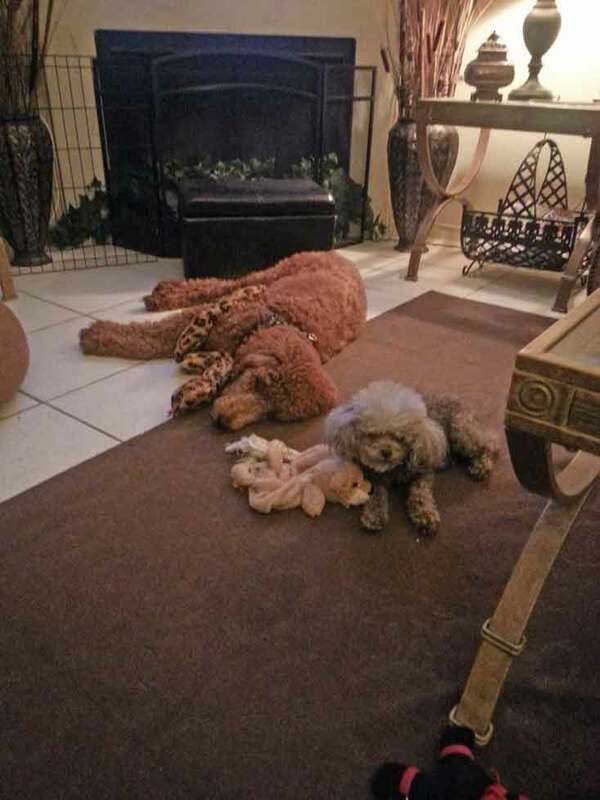 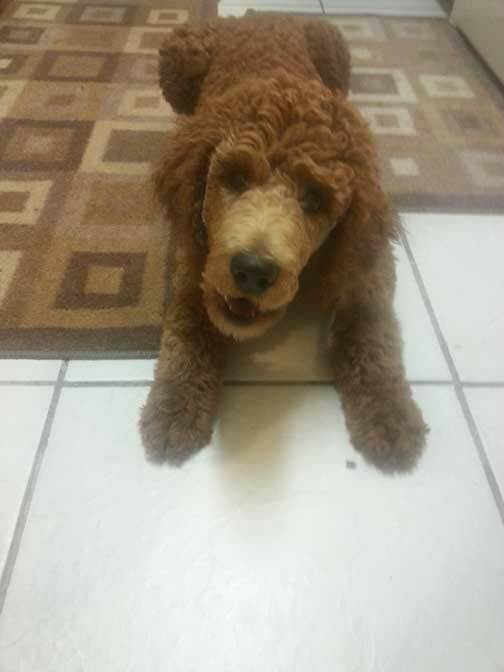 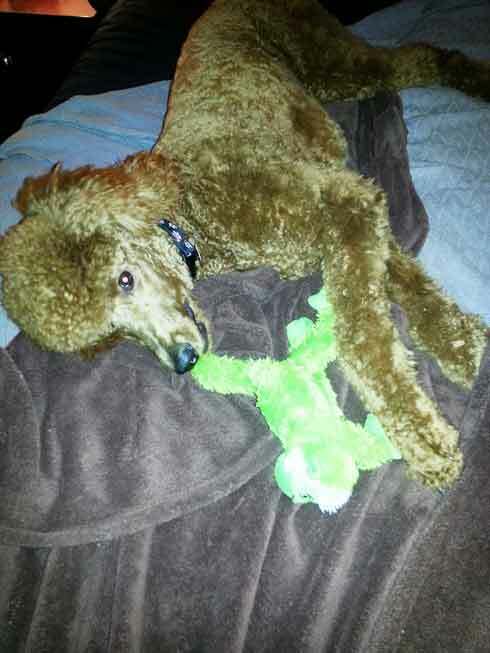 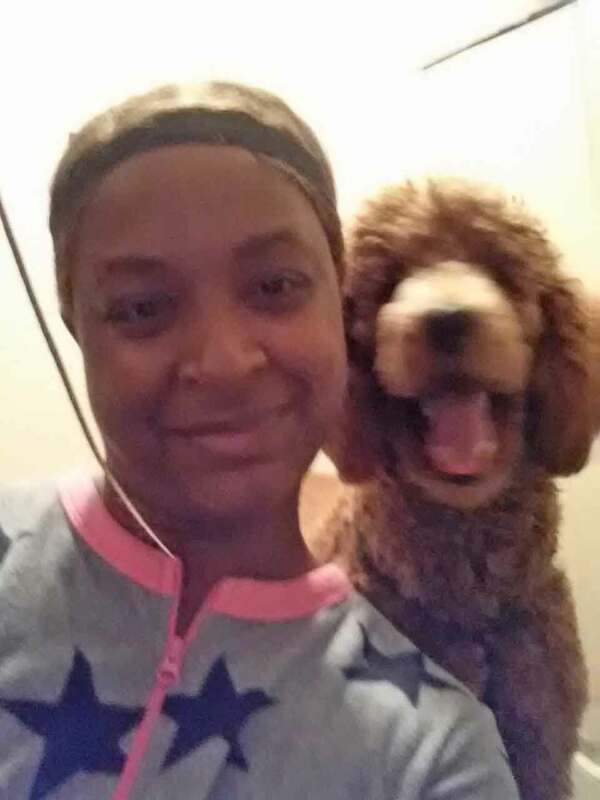 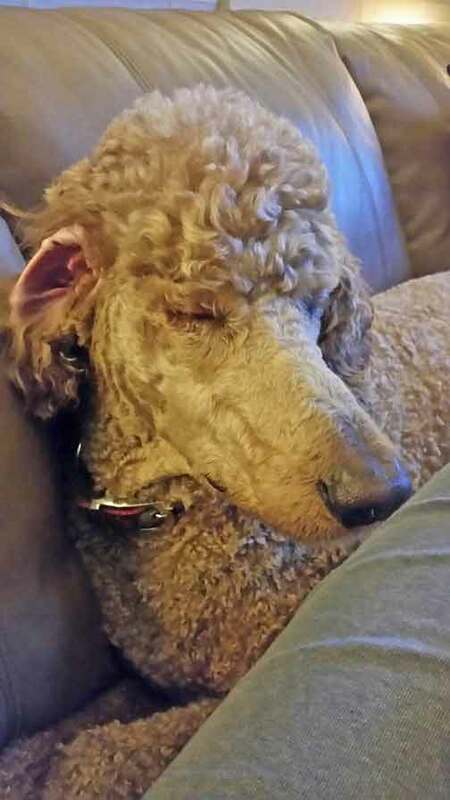 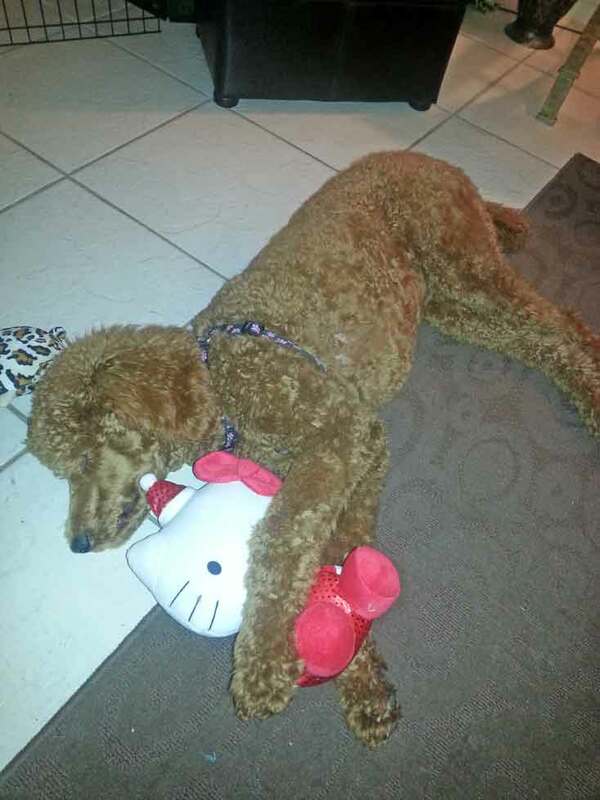 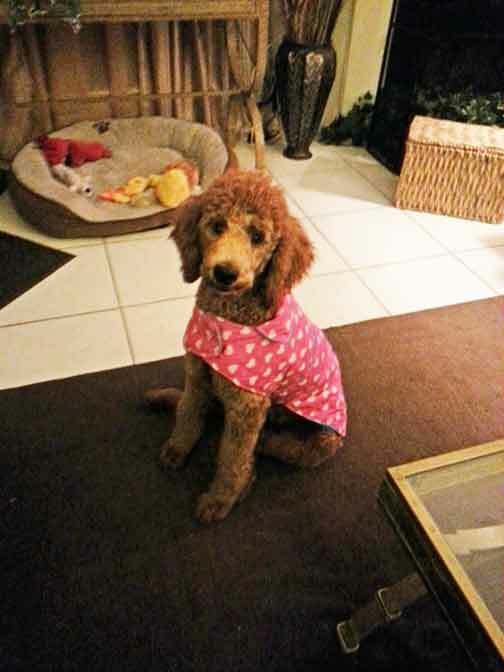 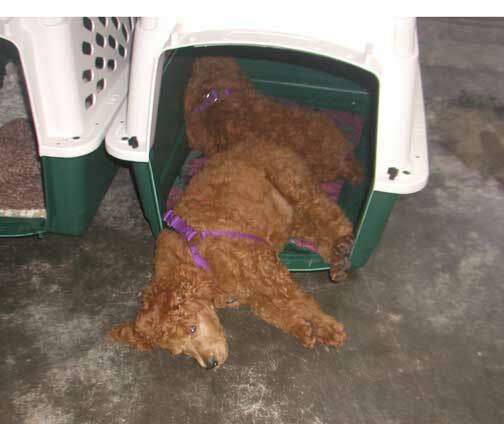 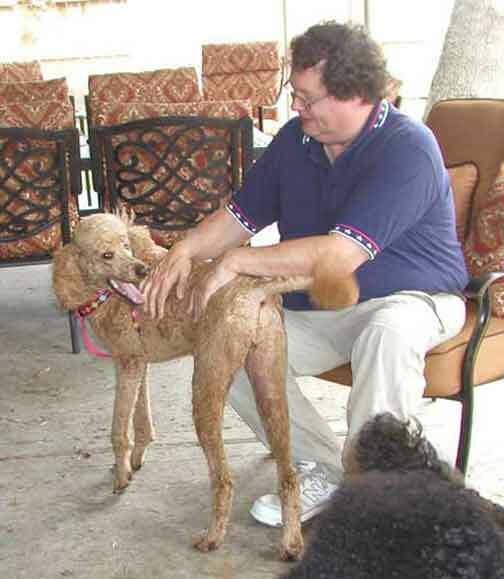 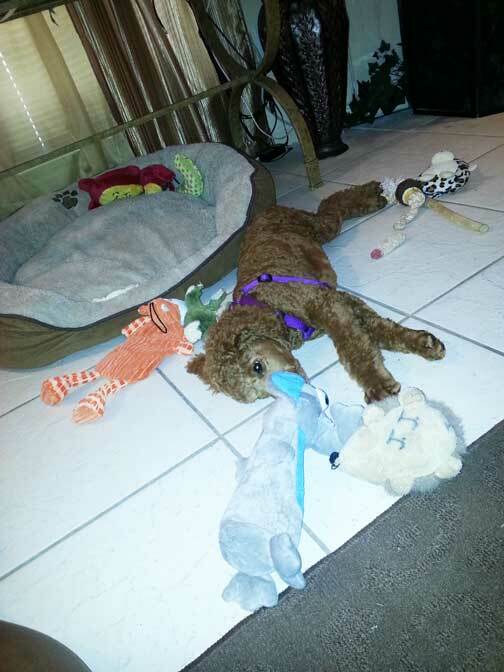 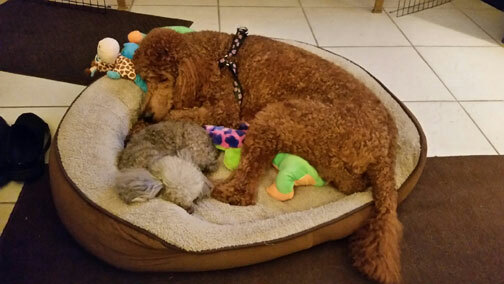 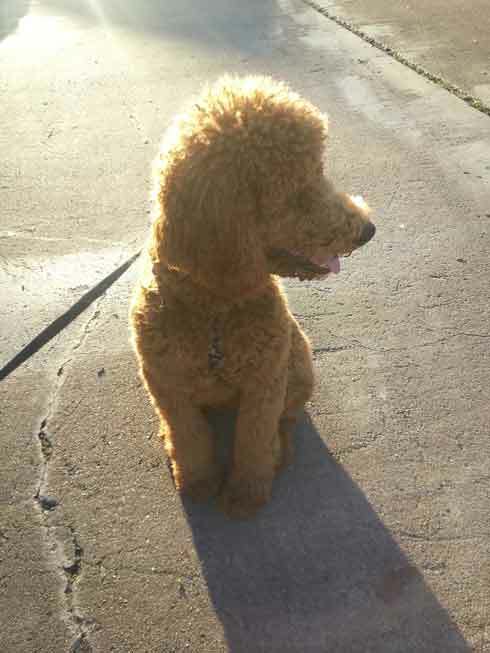 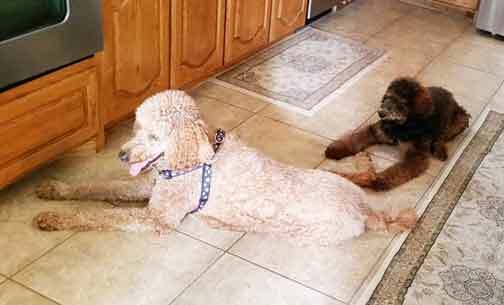 Standard Poodle Red Kolby at home in Houston, TX. 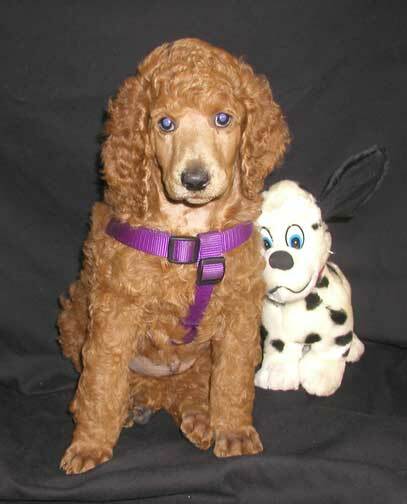 Parents Red Fire x Red Daniel born 06/29/14 -"I am already getting so much attention, I love it!" 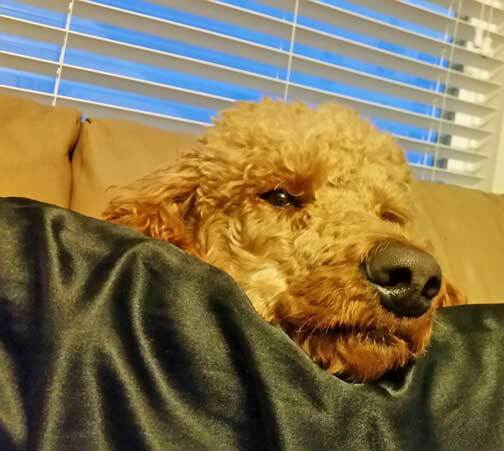 Somebody doesn't looked to pleased. 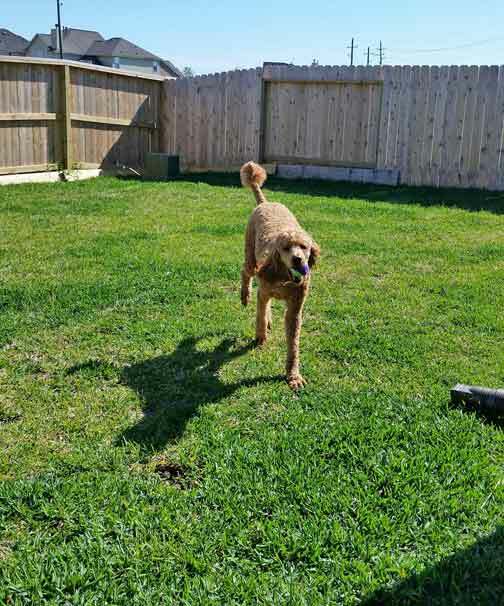 She had a blast playing with her doggie friends, not so much the picture part. 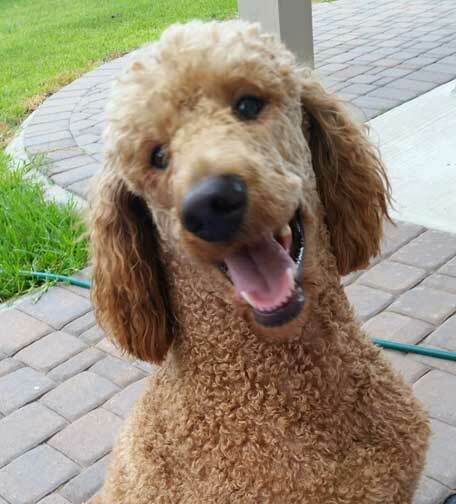 I'm smiling for you mom! 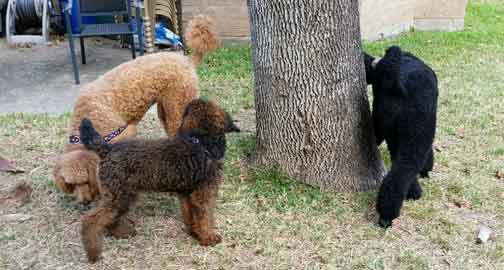 I get to have a play date with Hannibal and Spartacus Woo Hoo! 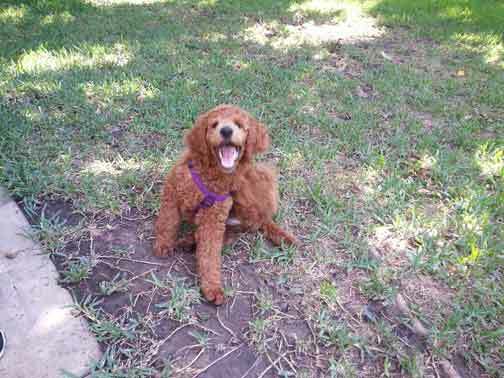 Happy Happy because I get to see Tes! 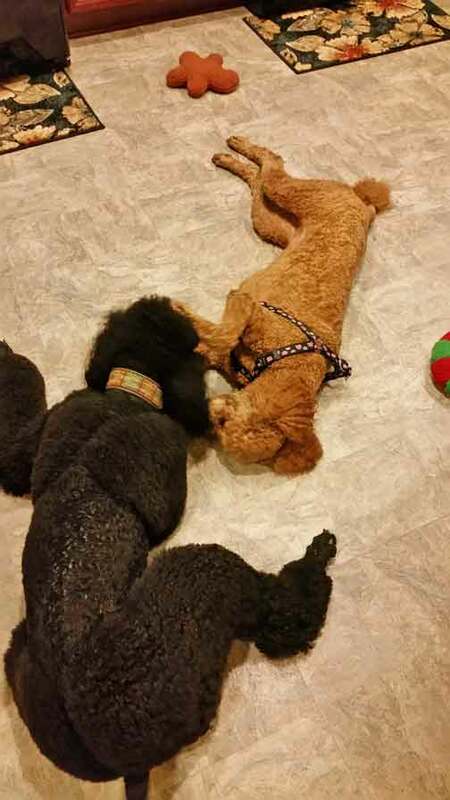 We have so much fun together that when we are done playing we come in and lay by each other too! 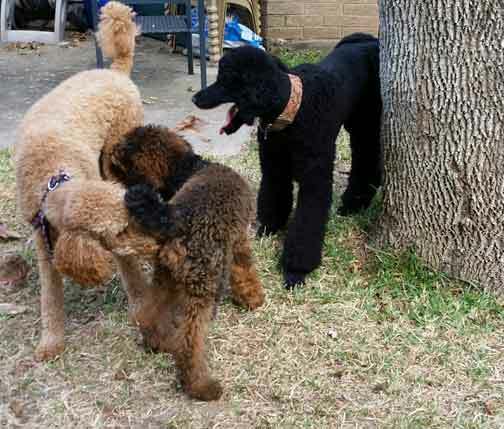 Its a spoo play date with Kolby, Spartacus, and Hannibal! 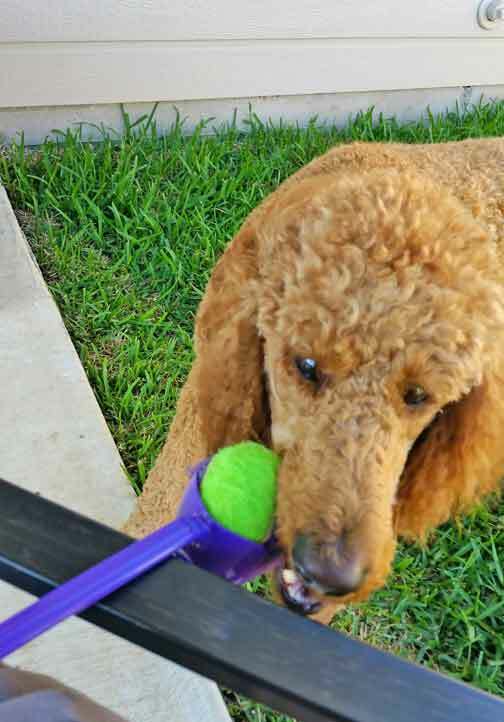 Tes thinks she needs to add a "Gotcha/Mine" photo to the winning water bottle contest! 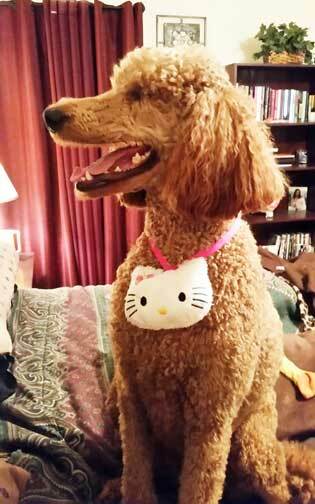 Here Kitty, Kitty...where are you? 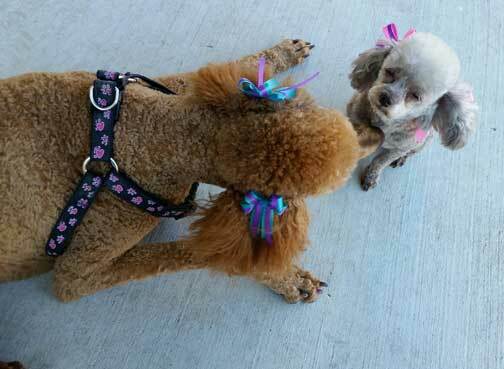 Come on Jazz, give me a smile...play with me..you look so pretty pretty ;o)...even with a Mohawk? 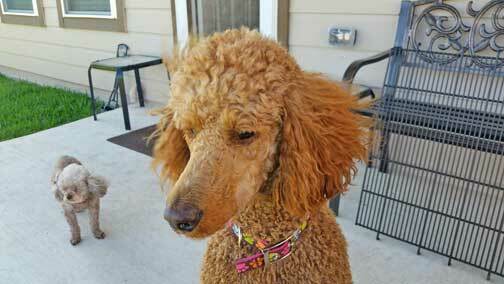 "Come on mom throw the ball....."
Her owner shares: "Kolby got a new bow collar today for being good a the vet. 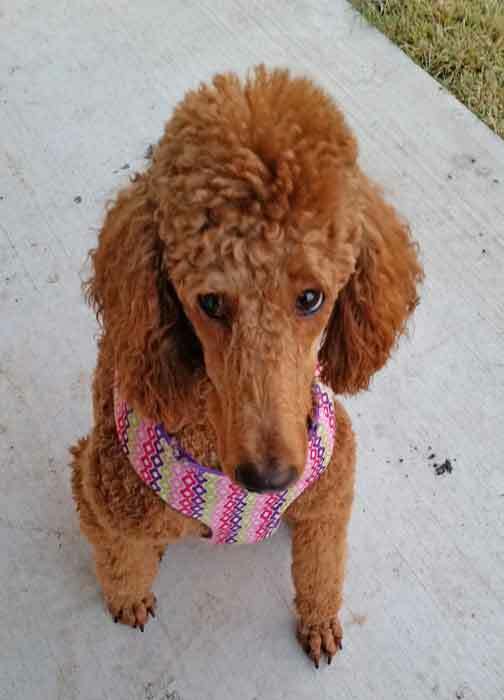 She wanted to show you as she sits for a profile picture. 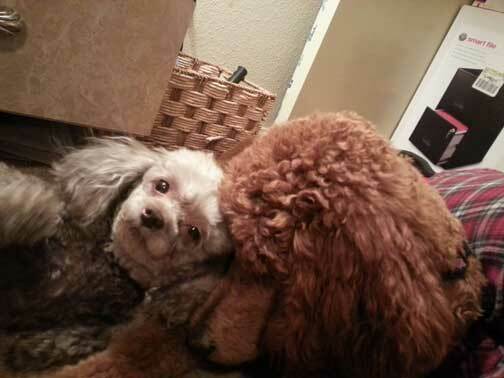 Such a DIVA"
"We love each other so much and love to cuddle together!" 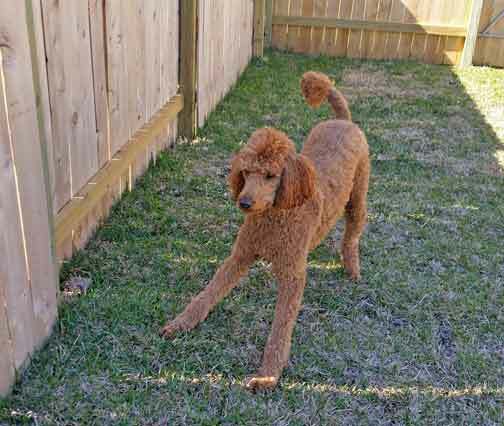 "Playing in my fenced in backyard, Woo Hoo!" 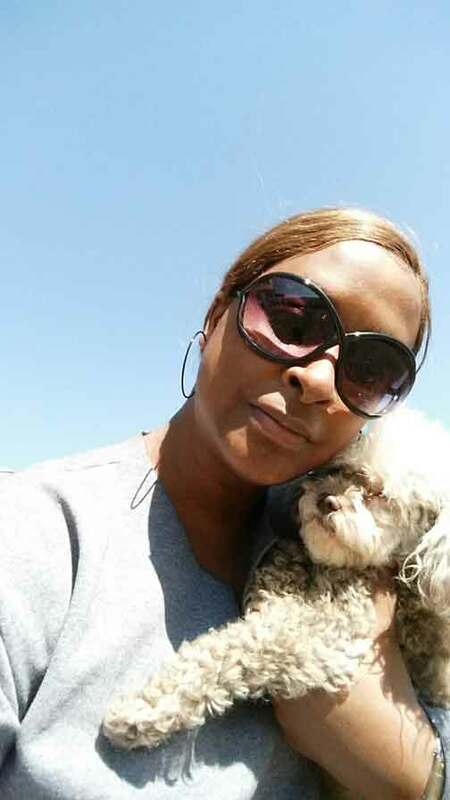 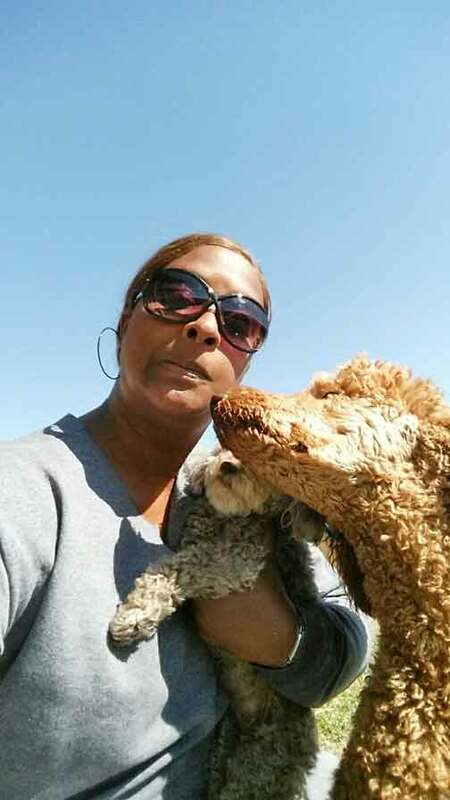 "Mom and my sister Jazz....."
".....Let me get in this picture!" 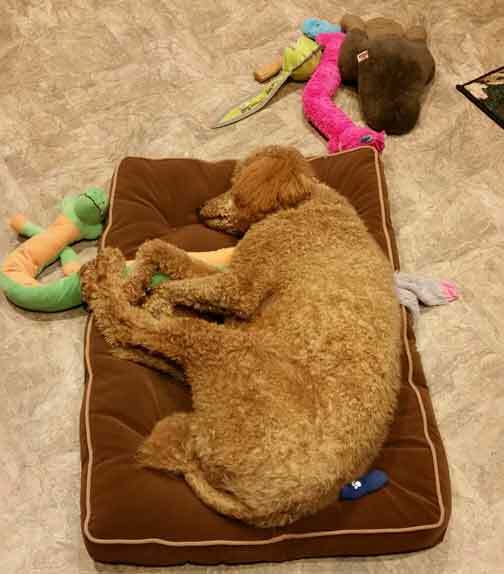 "After a busy day outside playing, it's nice to come in for a nap!" 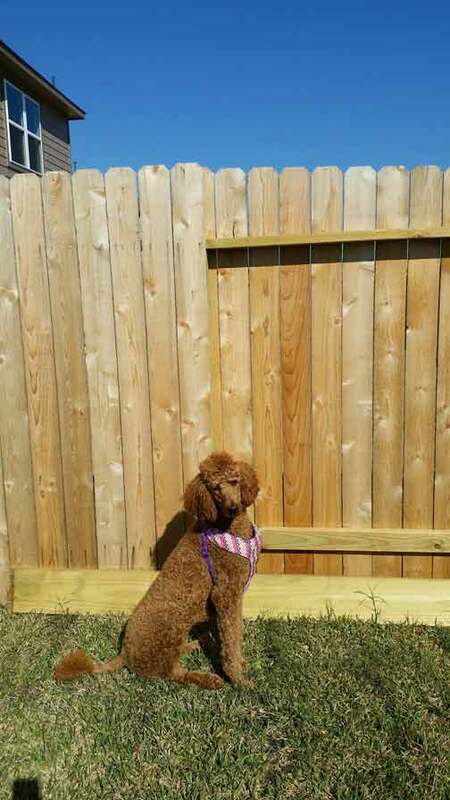 "I love my new fenced in back yard, it is so much fun Woo Hoo!" 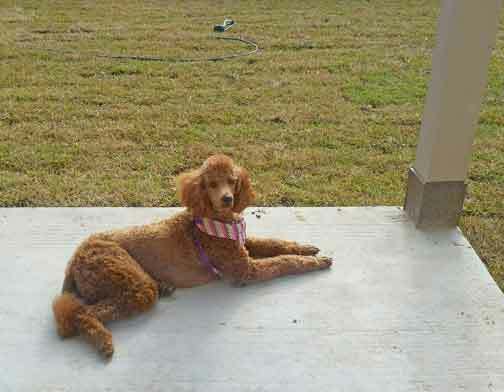 "I am enjoying my new backyard at our new house! 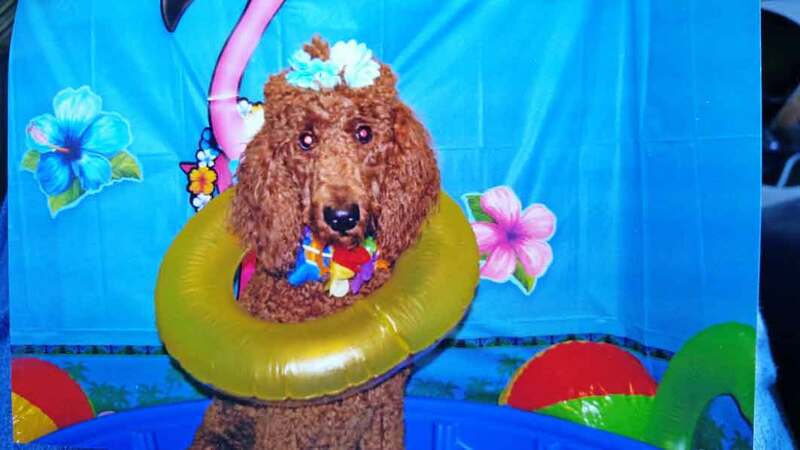 Woo Hoo!" 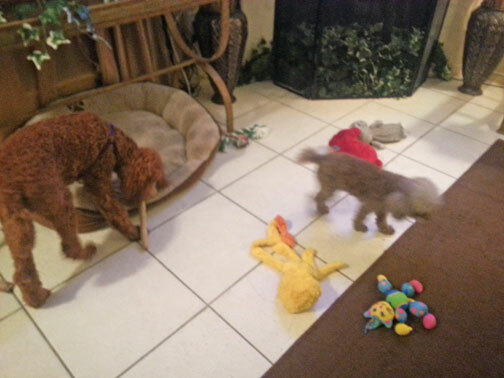 birthday toys. 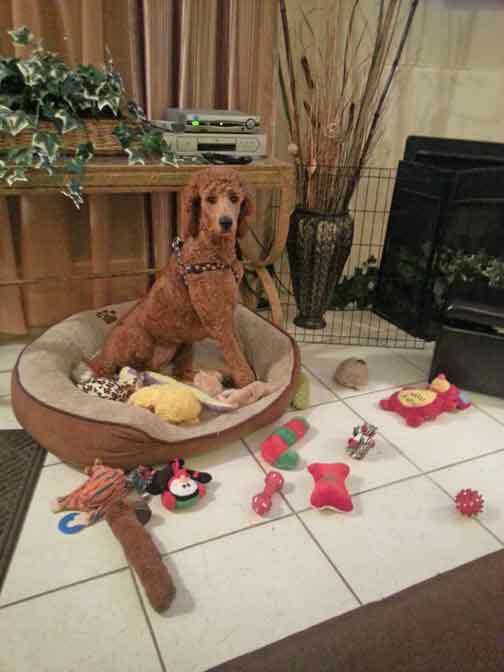 I finally turned 1yr Woo Hoo!!" 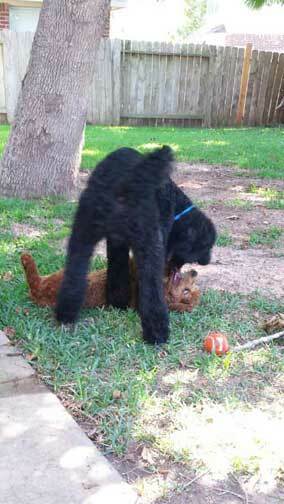 "Come on Jazz let's play!" 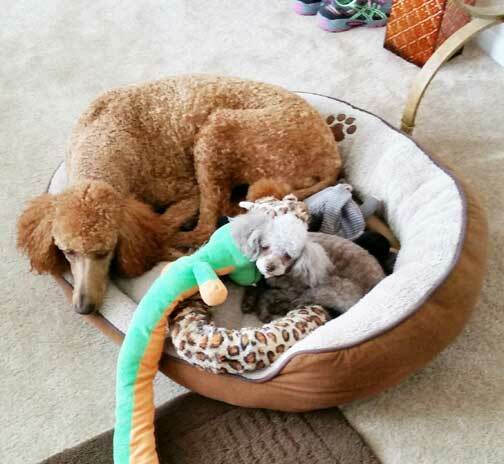 "Don't worry sister Jazz, I will keep you warm." 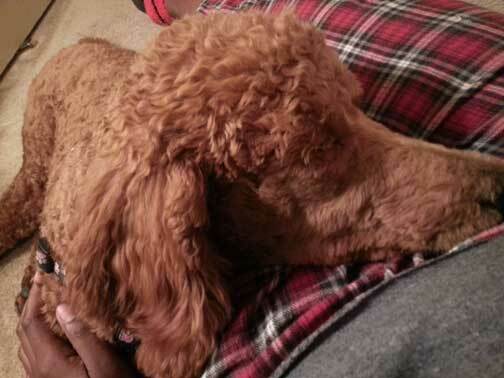 "Look at how vicious I can look...grrr...."
"Can I get up on your lap please, momma?" 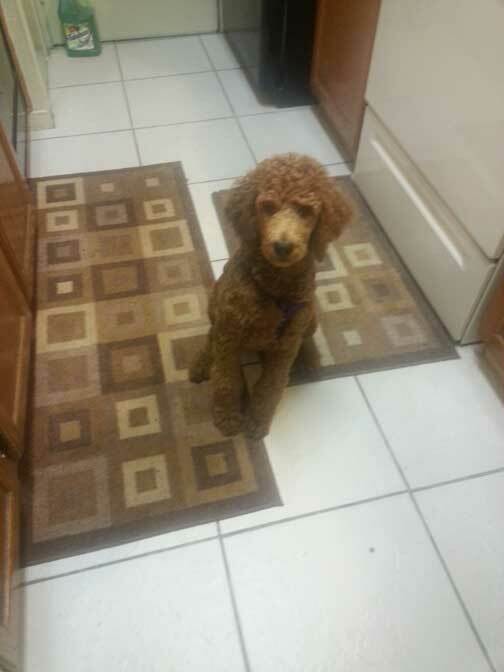 up and she now weighs 61.1lbs. 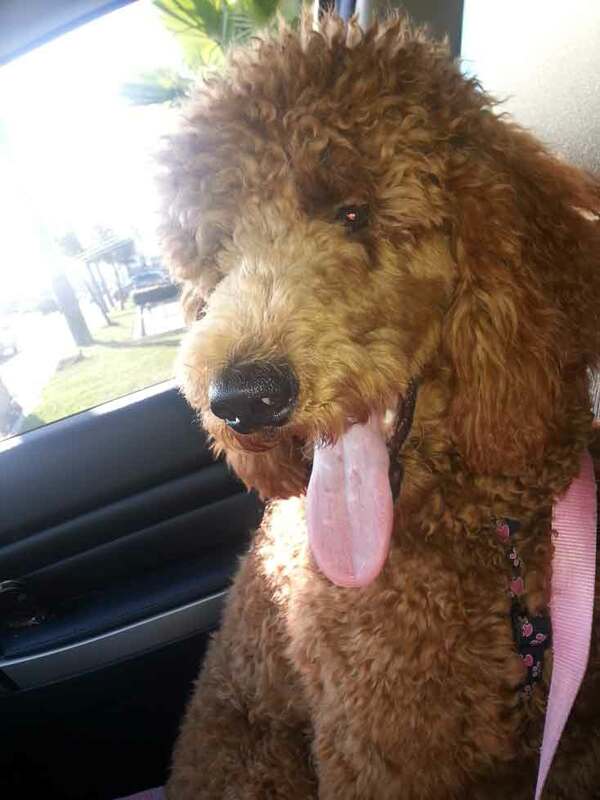 WooHoo she's a big girl. 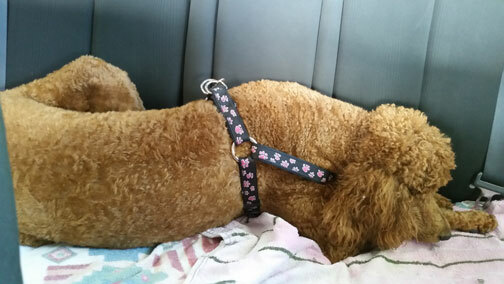 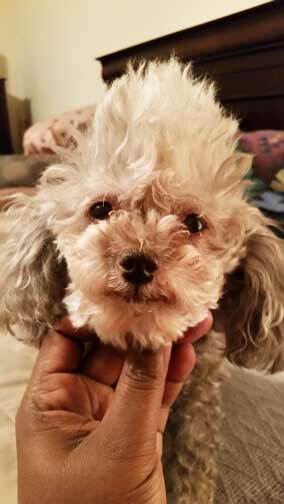 The vet said she still has more growing to do." 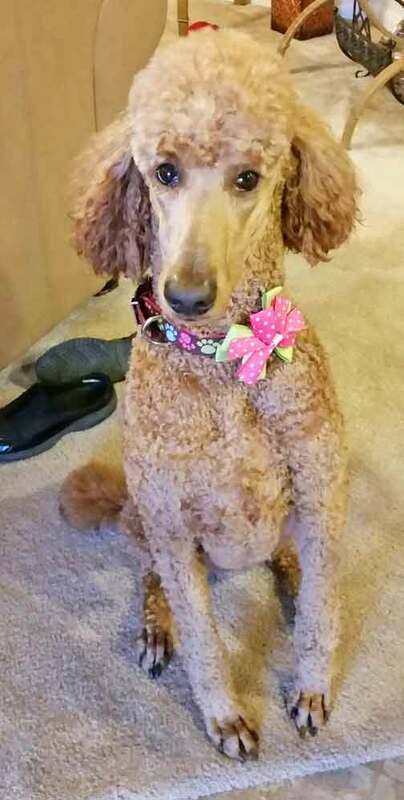 "I am such a proper girl!" 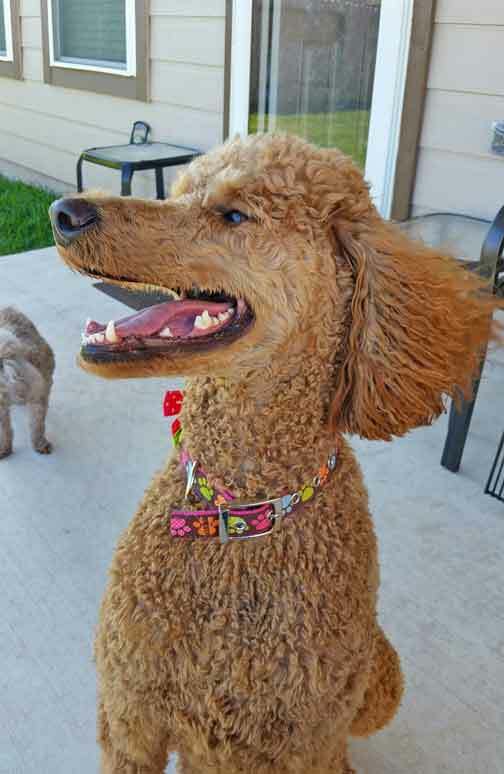 "That no sun feels so nice!" 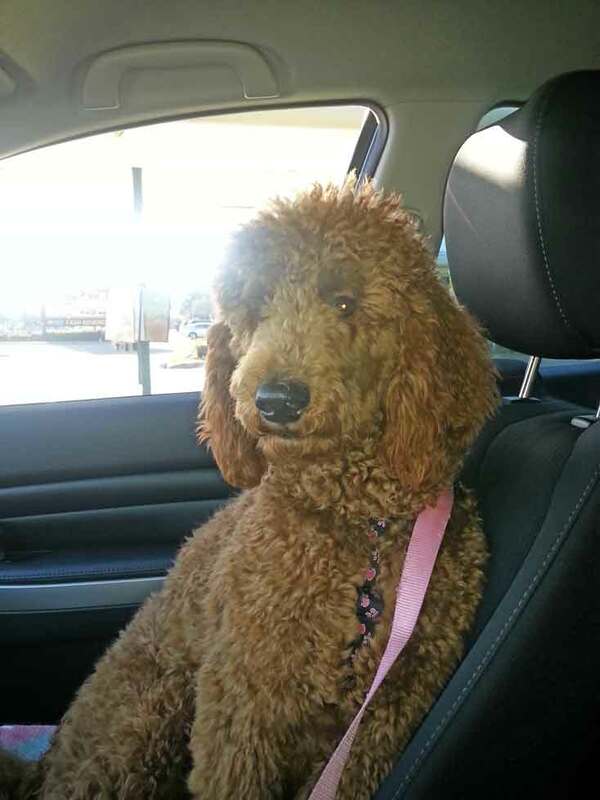 "All Spoos love to go for car rides! 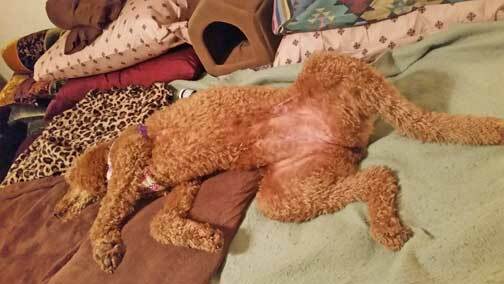 Woo Hoo!" 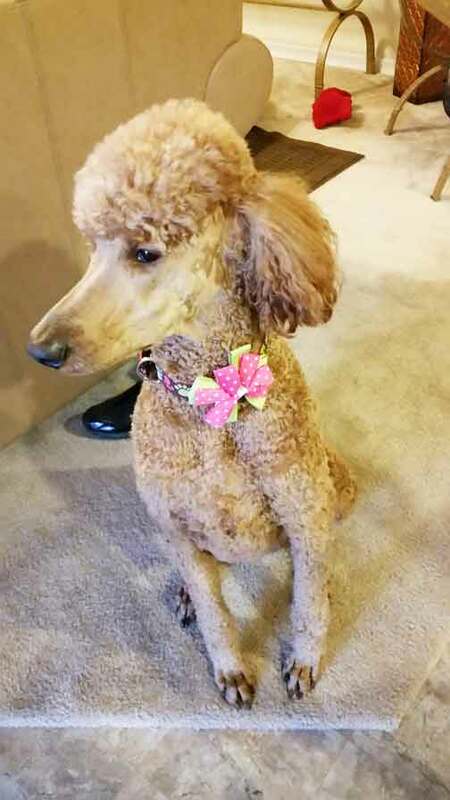 "I am such a sweet and beautiful girl!" 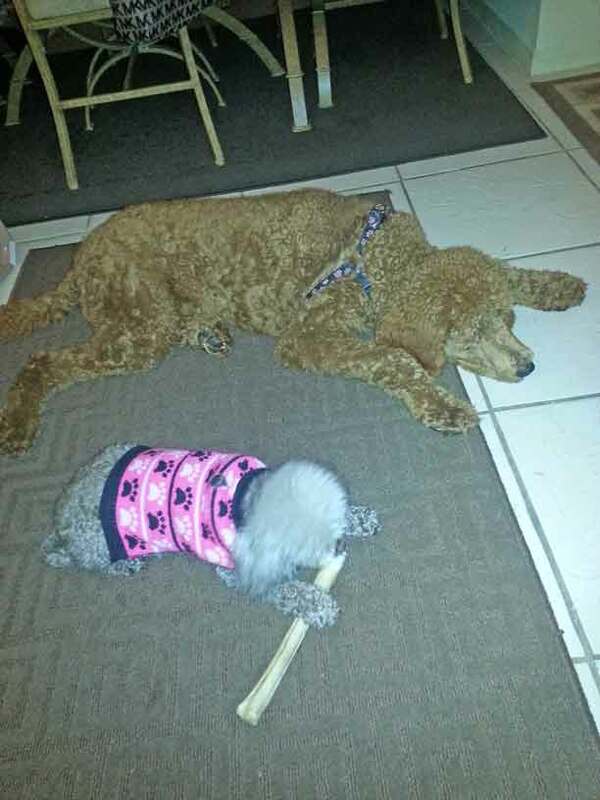 "Jazz and I taking our afternoon nap...."
"Hmm my sister Jazz is eating my bone......"
"Jazz is blocking me from MY BONE...."
"Maybe we will try to share it...."
"Mom, Jazz is trying to take MY BONE again!" 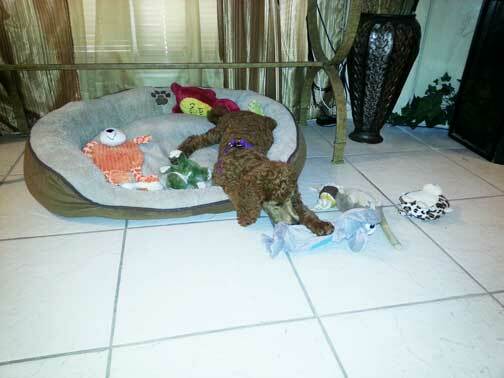 "I'm a spoiled girl. 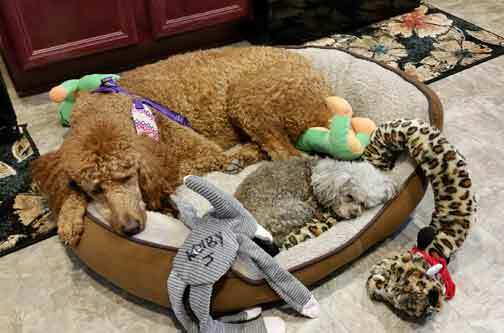 I love to lay in my mommy's lap, after I push my little big sister Jazz out...."
"Nap time, I wore myself out playing with all my new toys!" 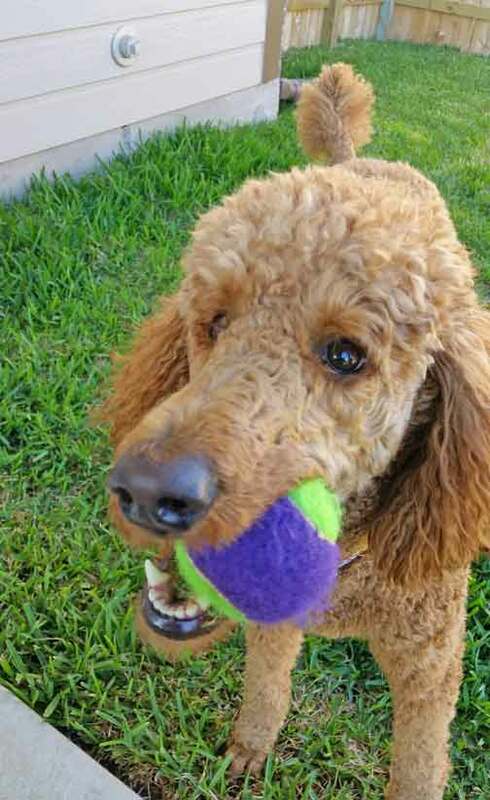 "Nap over, time to play some more!" 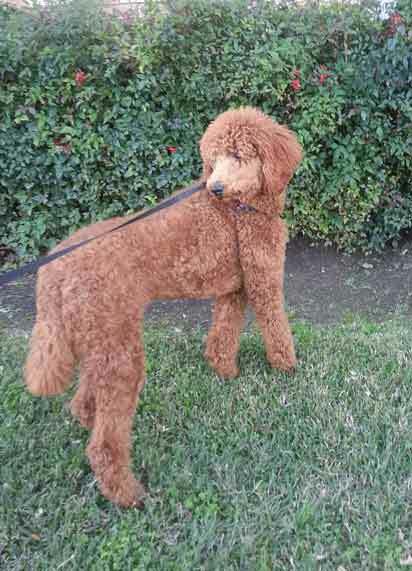 "Look how much I have grown, but I still have that beautiful red color!" 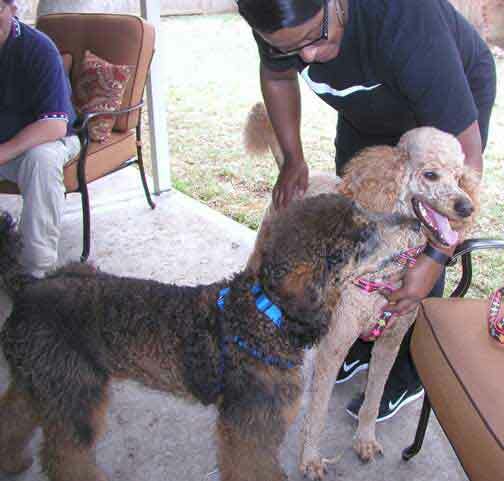 "Jazz and I love to play together...."
"Do you want to play, please......"
"My new hair cut, it is too hot in Houston to have that fluffy fur. 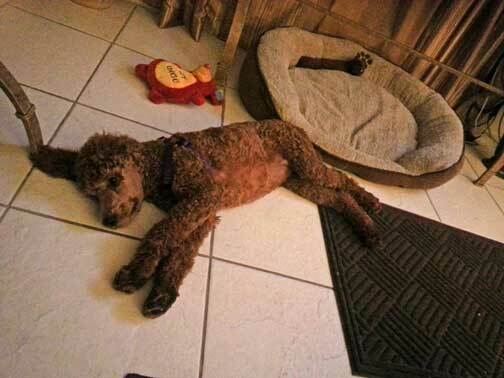 That feels so much cooler!" 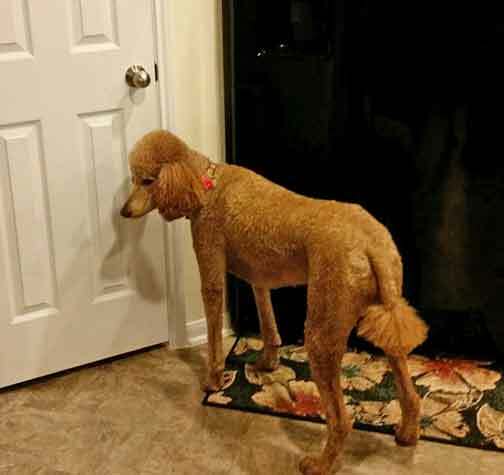 "Wow is this just for me? 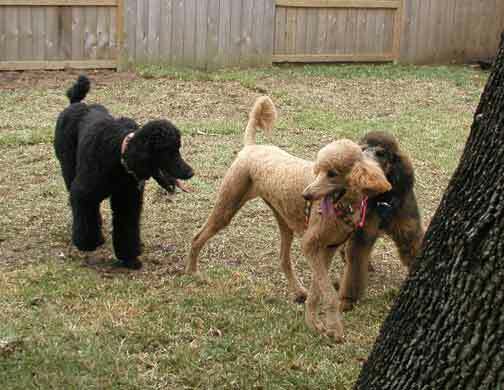 Woo Hoo, what fun!" 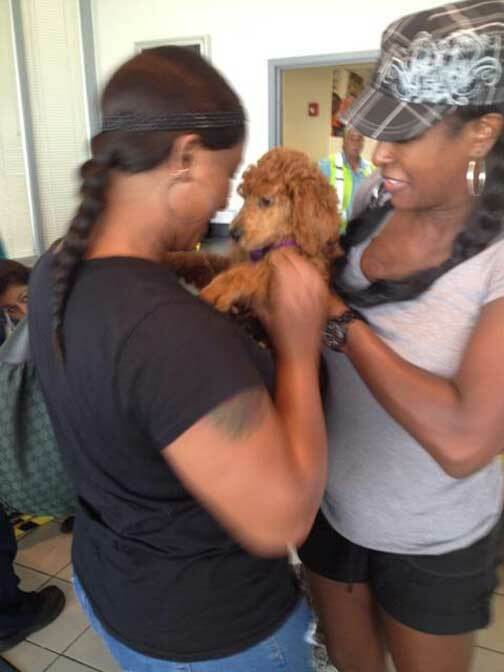 "Meeting my new family for the first time, Woo Hoo!" 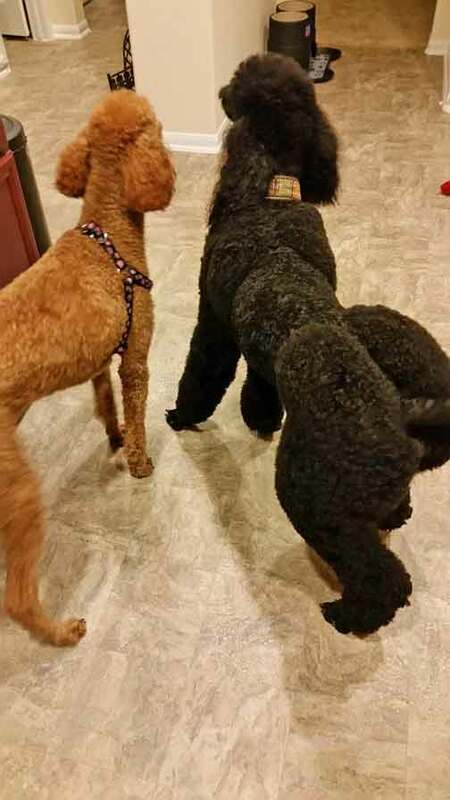 "Before I went to my new home I got to spend some time with Yarrow (up and coming breeding female of TI), she was tons of fun!!" 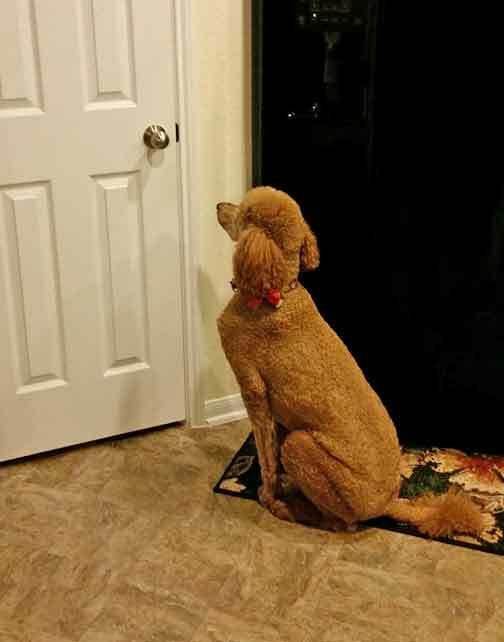 "I am patiently waiting to go to my new home." 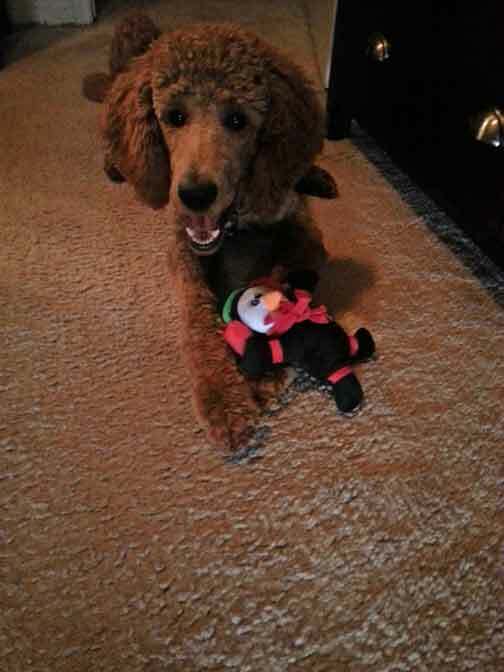 "Look at this face, I am such a doll!"